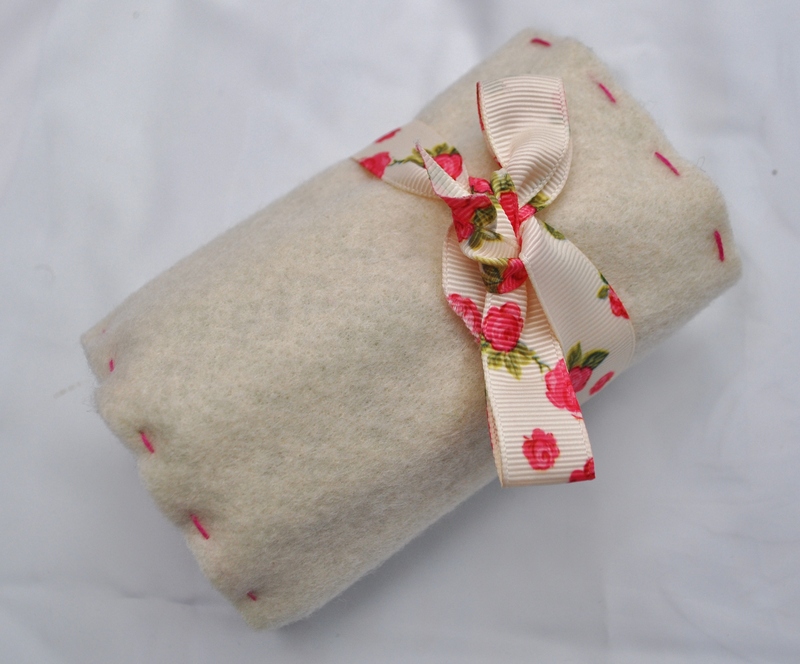 gembelina | Welcome to my little corner of crafty goodness with some of life's little delights thrown in along the way. I love this one! I got this idea from here but I got my little one to write the words on so its more personal. 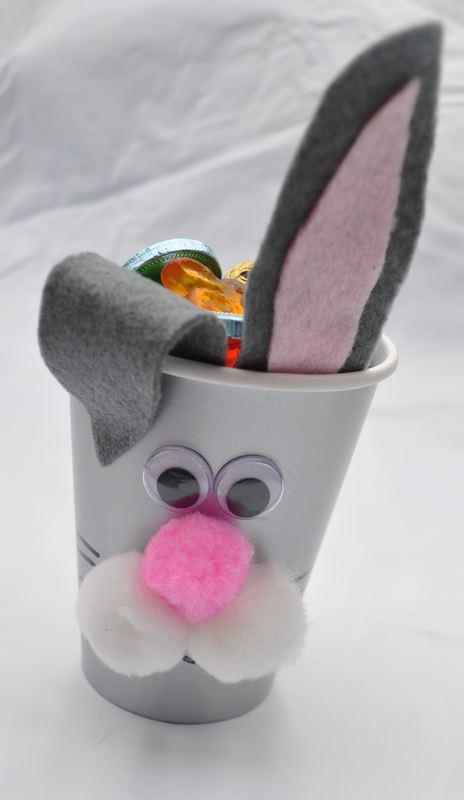 You could make this for Fathers Day or Mothers Day or just any occasion to make another person smile. This is so simple to make. 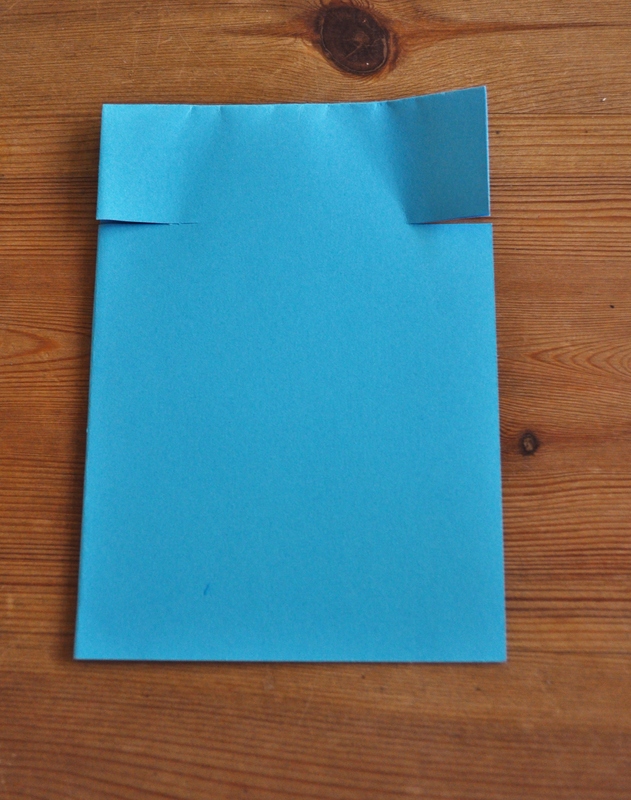 You just need card, glue and a marker or felt tip. 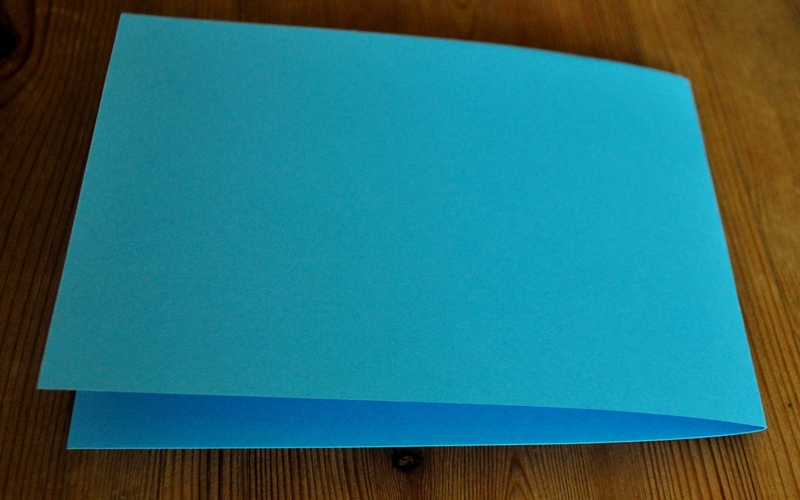 I used a sheet of scrapbook card because its bigger than A4 and its double-sided but you can use any card. Draw around your little ones hand, I drew around both and cut them out. 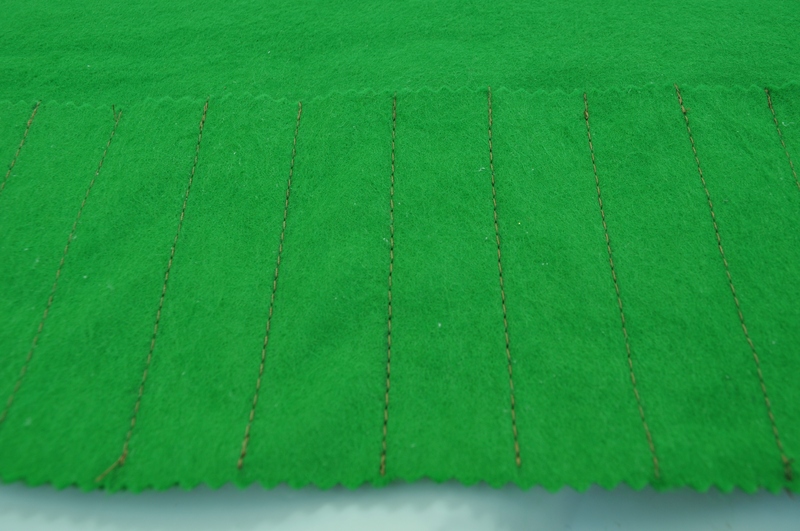 Cut a strip as long as you can or you could stick two pieces together and fold it up. 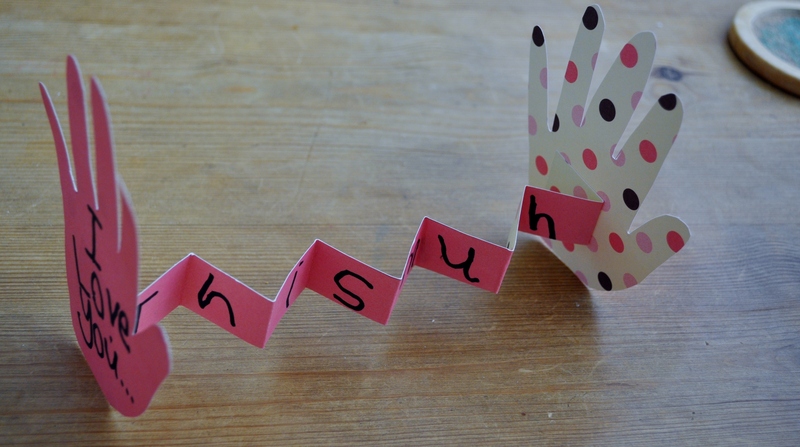 Ask your little one to write ‘This Much’ across the strip and ‘I love you’ on the front of one of the hands. 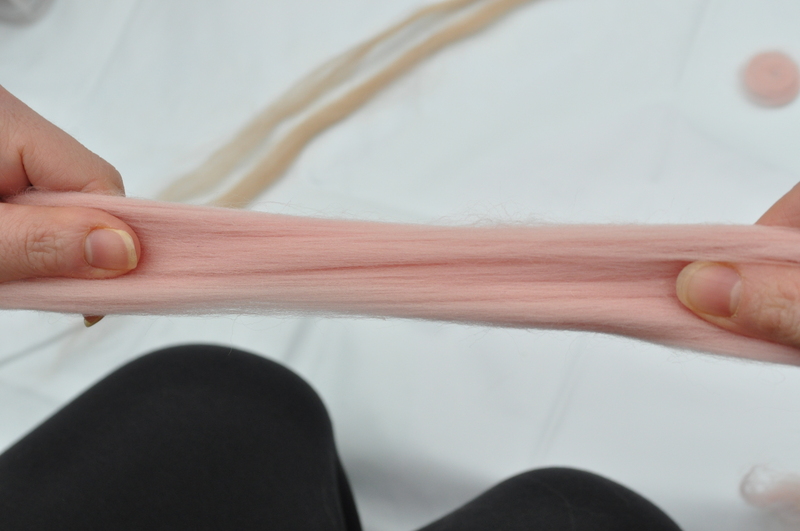 Then just glue the strip to the hands (I matched up the thumbs so the pink was on the outside of both hands). You may have to cut across the bottom of the hands to make it stand up! Its great isn’t it! I even found a pink envelope to put it in….hope Daddy doesn’t mind that!! 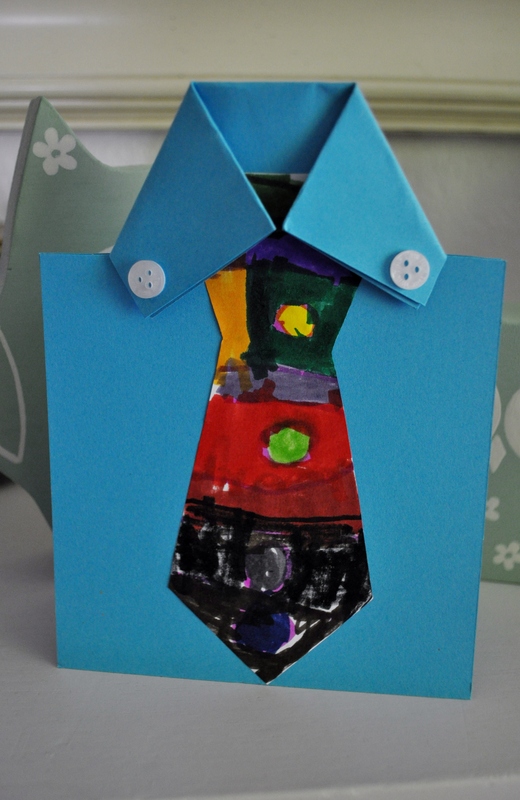 This entry was posted in Childrens Craft, Toddler crafts, Tutorials and tagged card for a man, Childrens craft card, dads card, DIY Card, Fathers Day, Greeting card, Handmade card, handprint card, Mother's Day, scrabook paper card on June 14, 2013 by gembelina. You will need A4 coloured card that you cut down the middle lengthways (you can make any sized cards though) and some white paper. 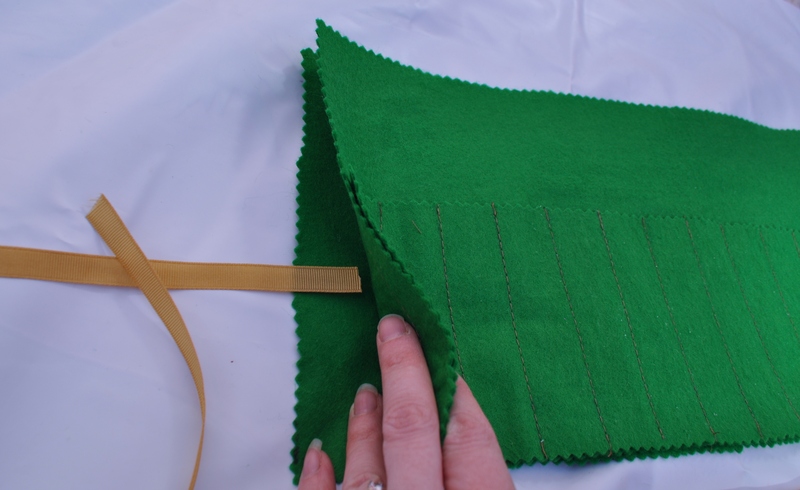 Then cut about an inch in from the top on both sides and fold in. 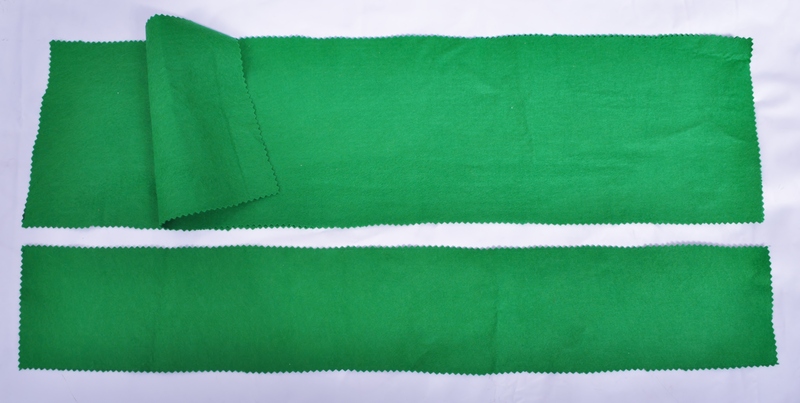 Cut a tie shape ensuring it fits inside the shirt – you need the tip of the tie to line up on the bottom edge. 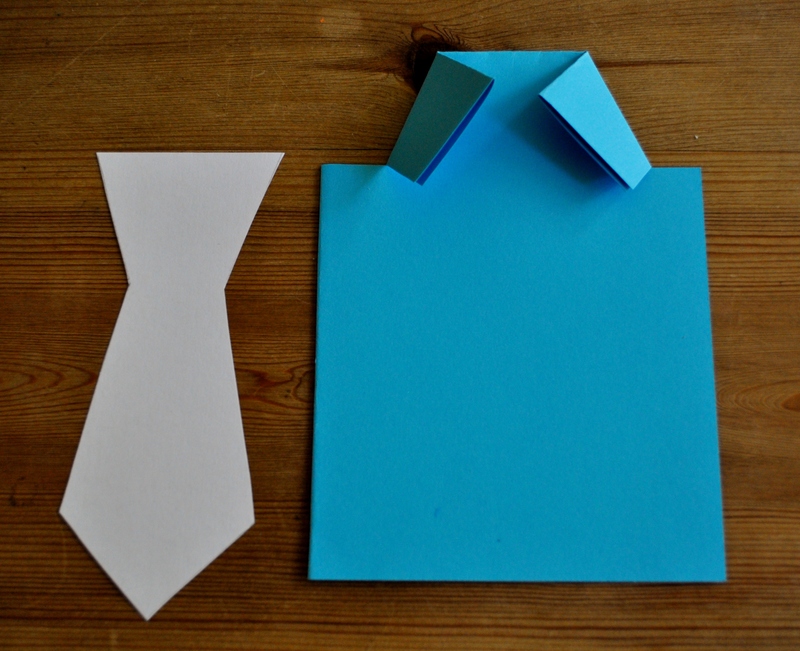 Now the fun part – your little one can decorate the tie however they wish – felt pens, paint, glitter, wool etc then stick it to the front of the card starting at the bottom so the bottom edge lines up, then add some small buttons on the lapels. Here are the ones we made when my neice and nephew came around. 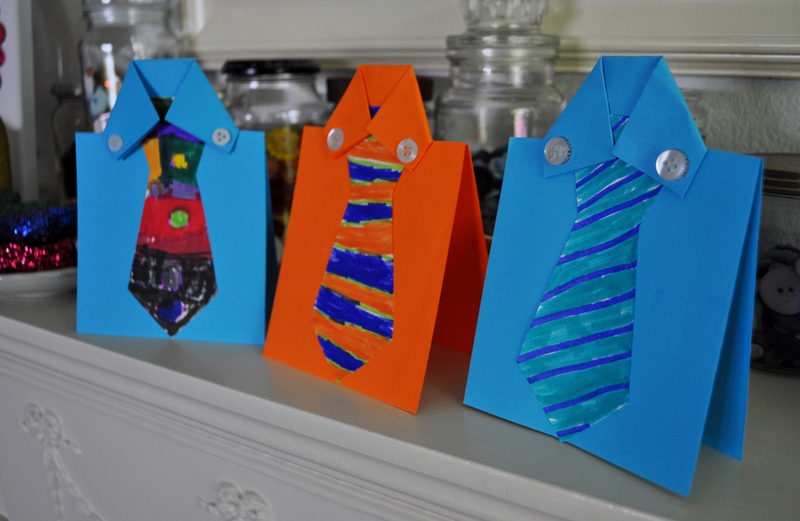 This entry was posted in Childrens Craft, Toddler crafts, Tutorials and tagged Childrens Craft, DIY Card, DIY fathers day card, Fathers Day, Fathers Day Card, Handmade card, Handmade dad card, Male Card, Shirt and Tie Card, Toddler Card on June 14, 2013 by gembelina. 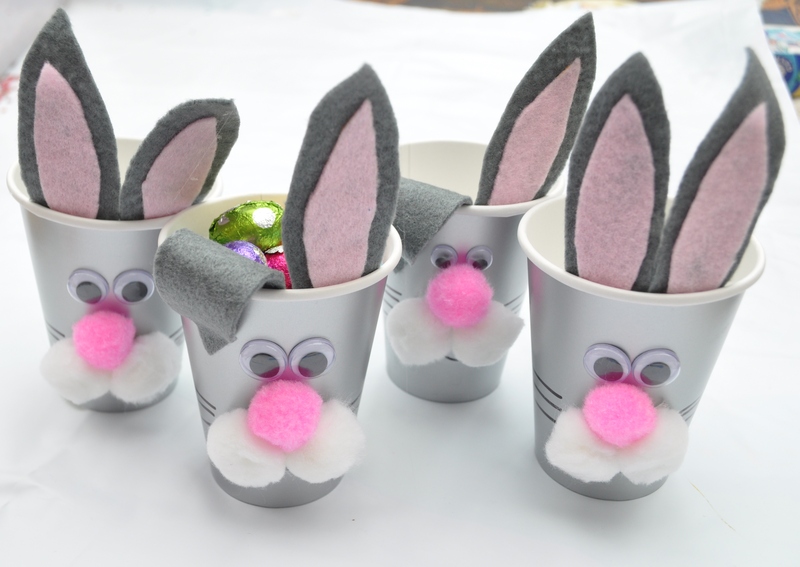 I made these little bunny cups as an alternative to buying easter eggs for my nieces and nephews as they get enough. 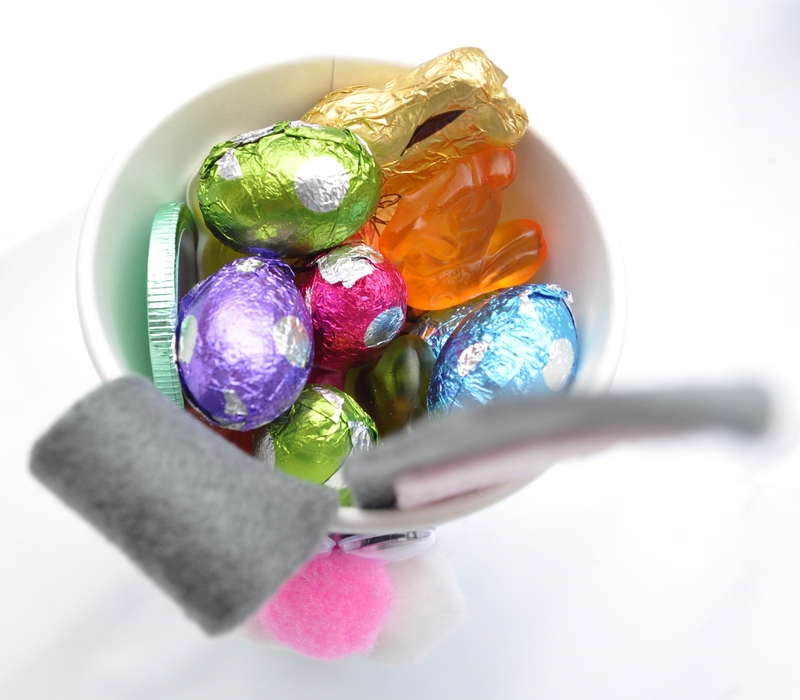 They are half filled with sweets, mini eggs and chocolate coins and they are pretty cute! They are very simple to make, and you don’t need to go by what I used to create them. 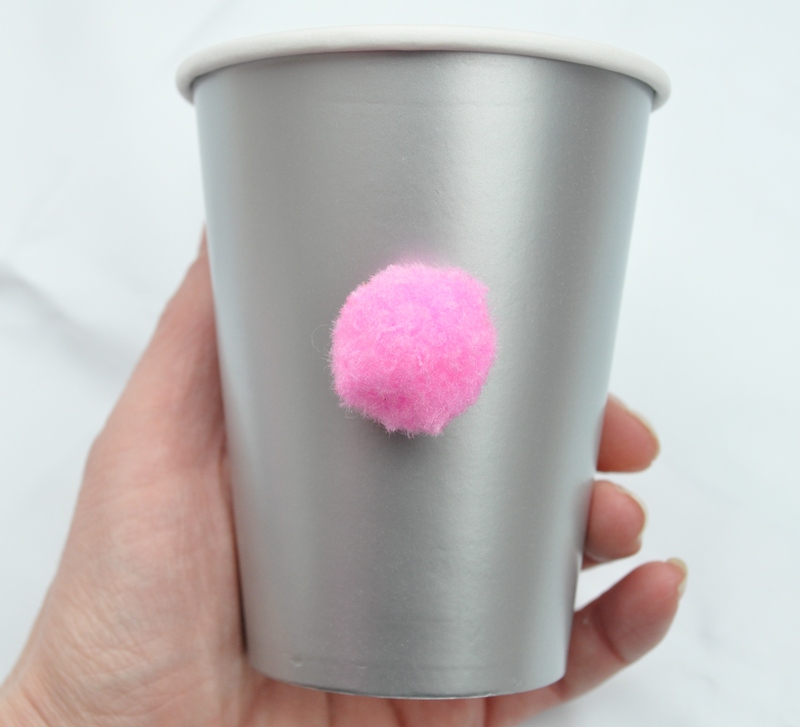 They would look just as effective with – card, paper, funky foam, cotton wool balls, buttons, sticker dots….you can use whatever you have to hand and in whatever colours you like – WIN! 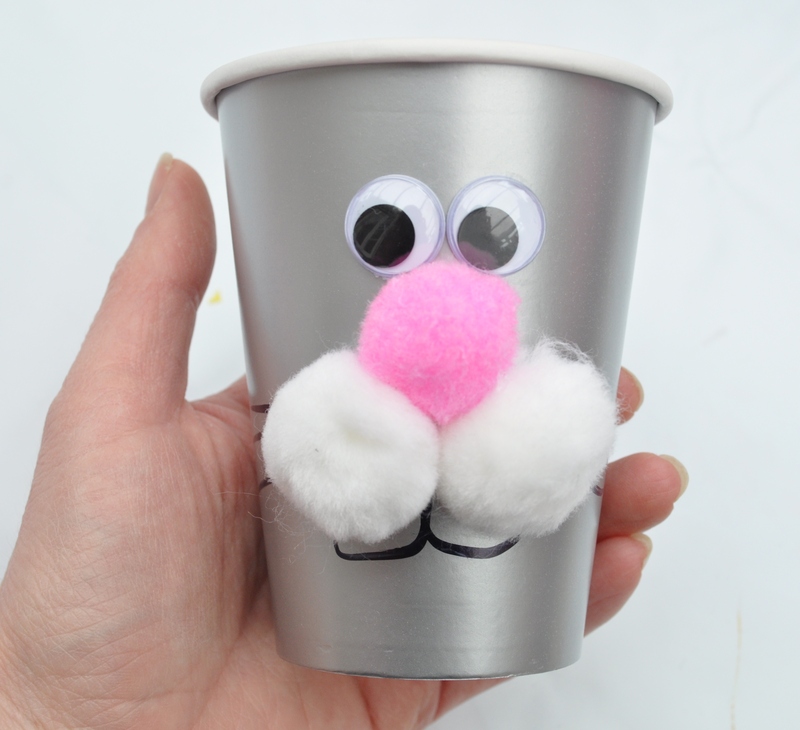 Take the cup and add a nose, ensure the seam of the cup is at the back to make it neater. I used a hot glue gun here as it’s quick but white gloopy glue would work fine. Add two pompoms just under the nose. Draw whiskers and a mouth. Doesn’t he look cute already! 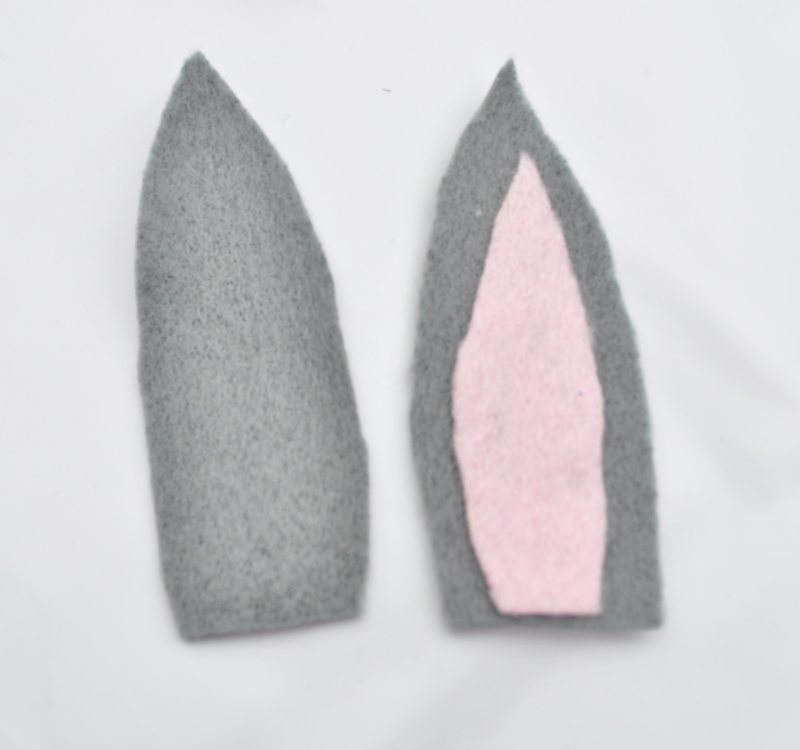 Cut two bunny shaped ears in two different colours with one colour being smaller than the other. Place the smaller one on top of the other and glue in place. If you are having two sticky up ears do this to both. If you are having one droopy ear then leave off the second smaller inner ear as in this photo. 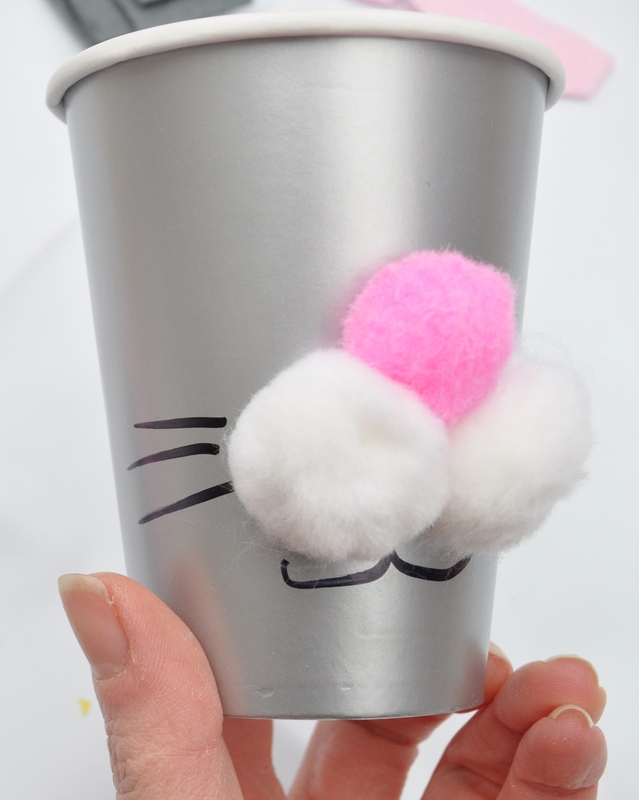 Glue the ears on the inside of the front of the cup. 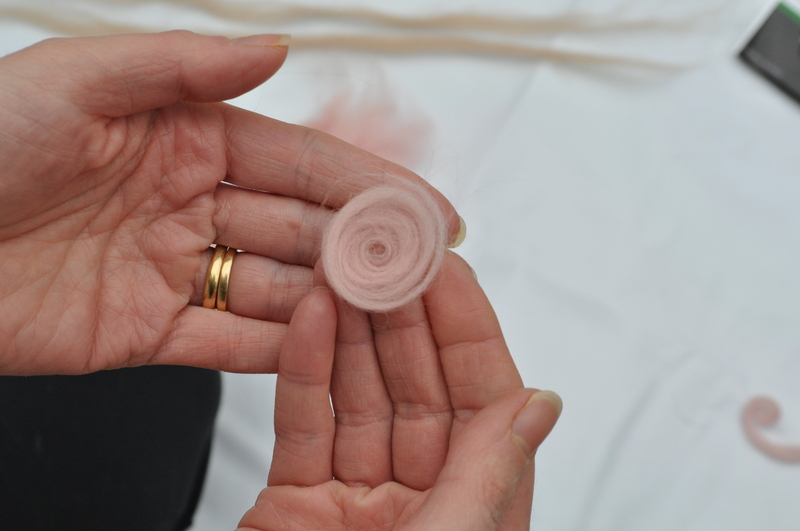 Add some glue to the tip of the ear with no inner piece and glue down to the side of the eye. ….I love him…..I’d be happy to receive this little dude! 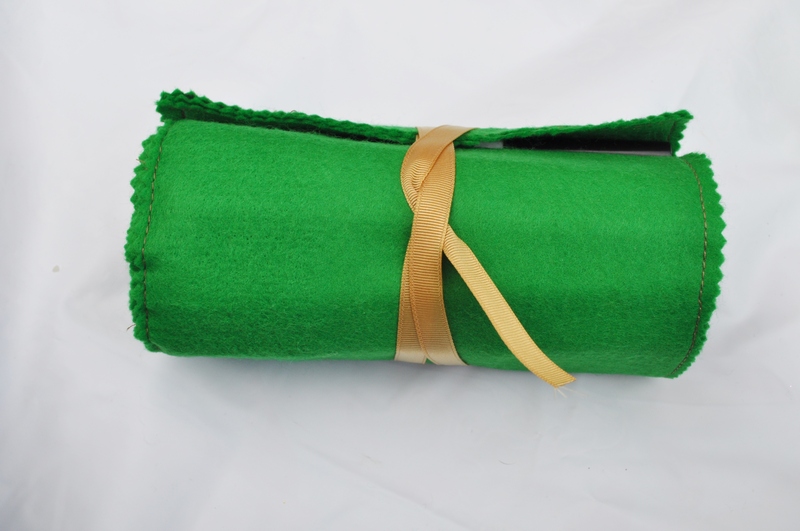 Add some scrunched up tissue paper to the base to fill out some of the room in there. Make as many as you need. My little one decided we had to have some with two sticky up ears, all I need to do now is fill them all up and they are ready to go! 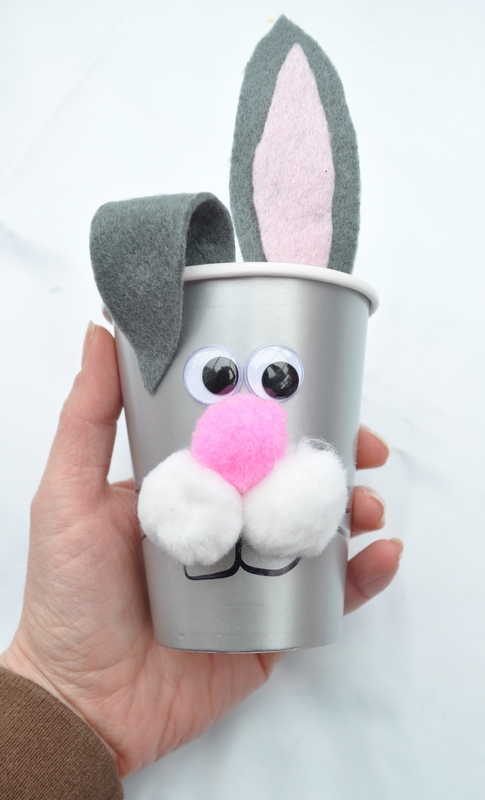 This entry was posted in Easter, Toddler crafts, Tutorials and tagged Bunny Cup Gift, Childrens Easter Gifts, Cup crafts, Easter crafts, easter decorations, Rabbit ideas, Toddler crafts, Toddler gifts on March 27, 2013 by gembelina. Easter is fast approaching and this year I have decided to decorate the house to give the girls a sense of excitement about Easter Sunday. I know these ‘believing’ years won’t last long so I want to make the most of every moment of wonder, for their sake as well as my own. 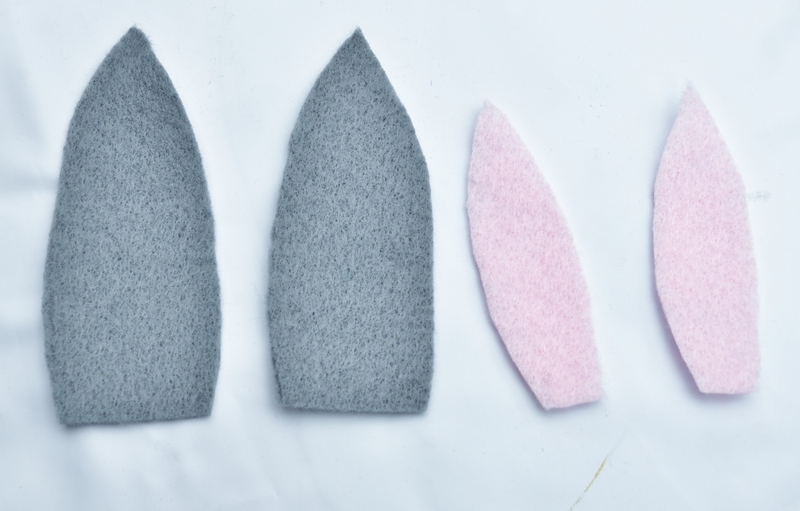 These are an adult only craft as the needle is extremely sharp. 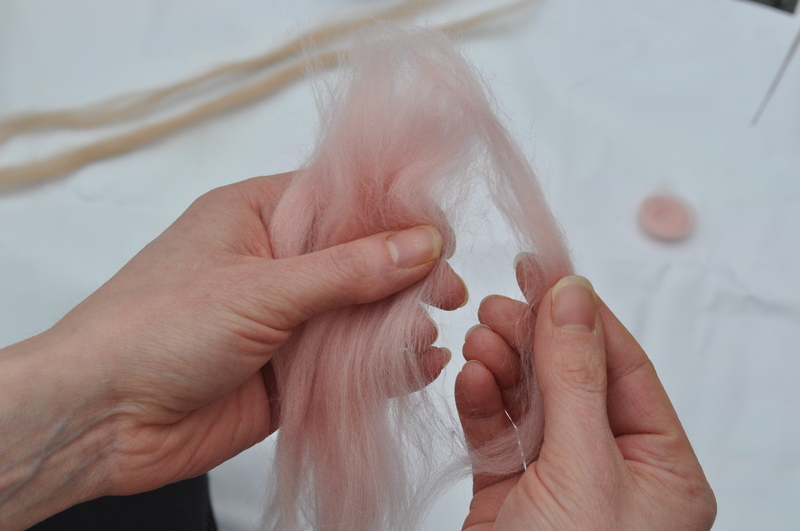 -A felting needle – I’d buy a couple as they can snap. 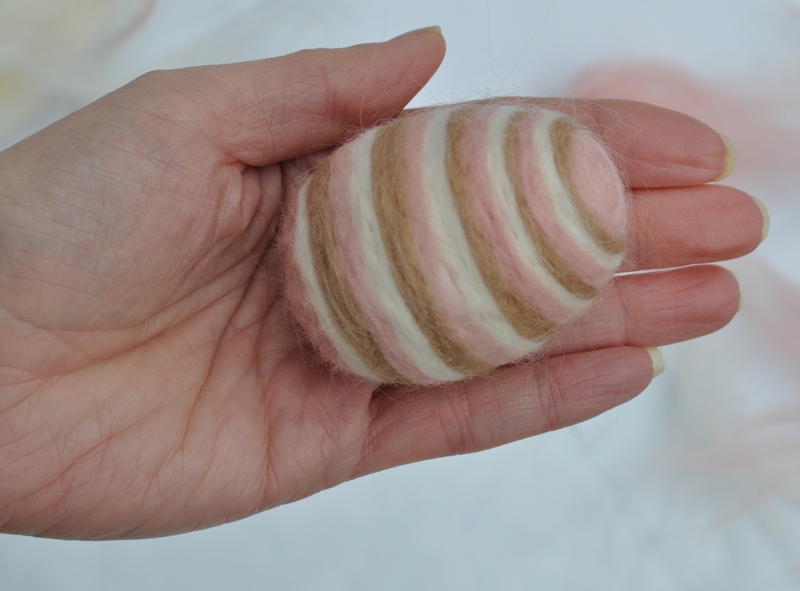 It has to be a felting needle as it has tiny barbs on the point that helps to felt the wool so a normal needle can’t be used. 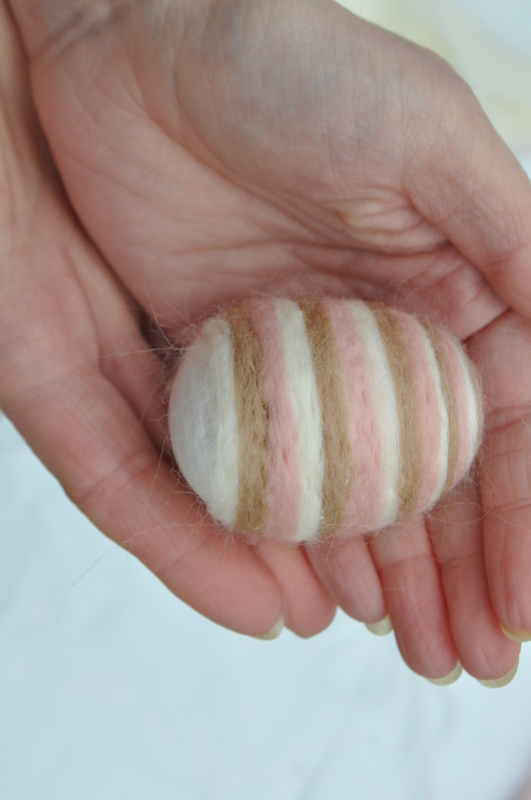 …..and the wool will naturally come apart. This gives it a feathery edge rather than a blunt thick edge which is more difficult to disguise and can look a bit lumpy. 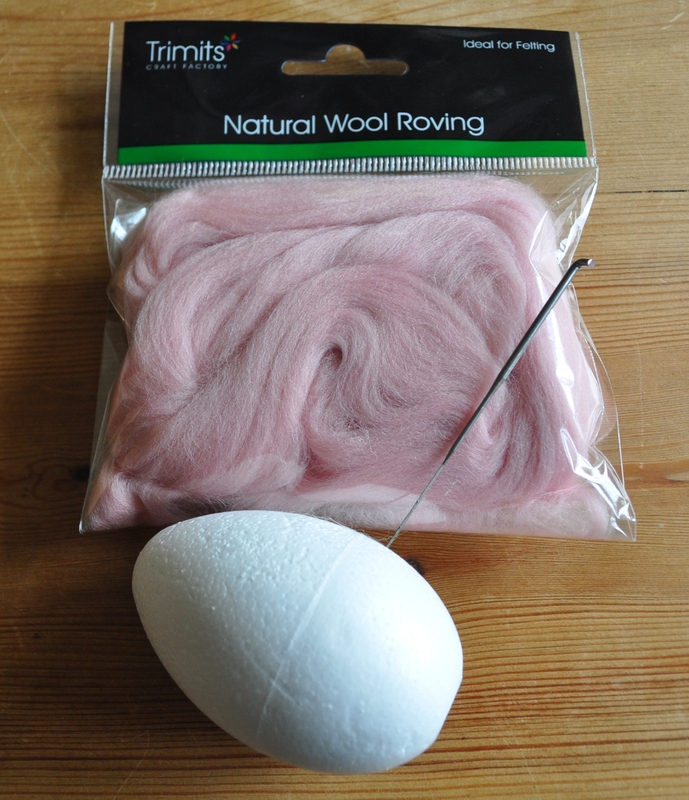 I start at the top of the egg so for this I pull out a strand of the wool roving. Start to coil the end of the roving up. 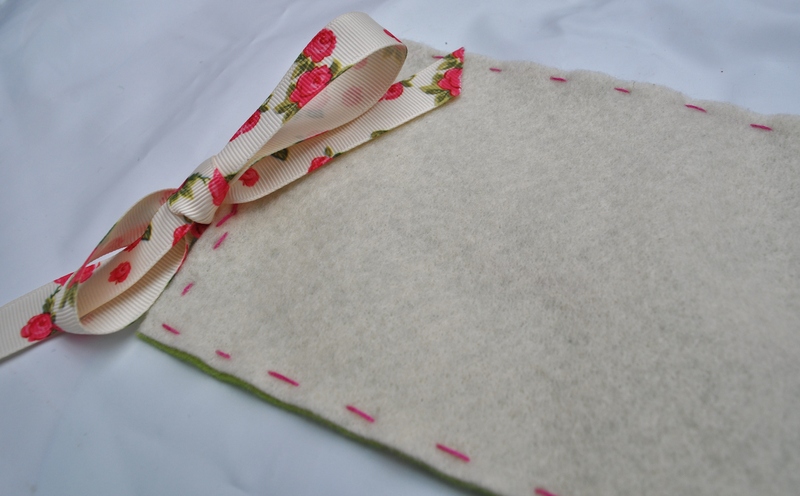 Make it a bit loose as the felting process will cover up the gaps. This is for the top of the egg. If you need to make it bigger then just add another strand at the end of the last one and continue to coil, it will naturally stay together. 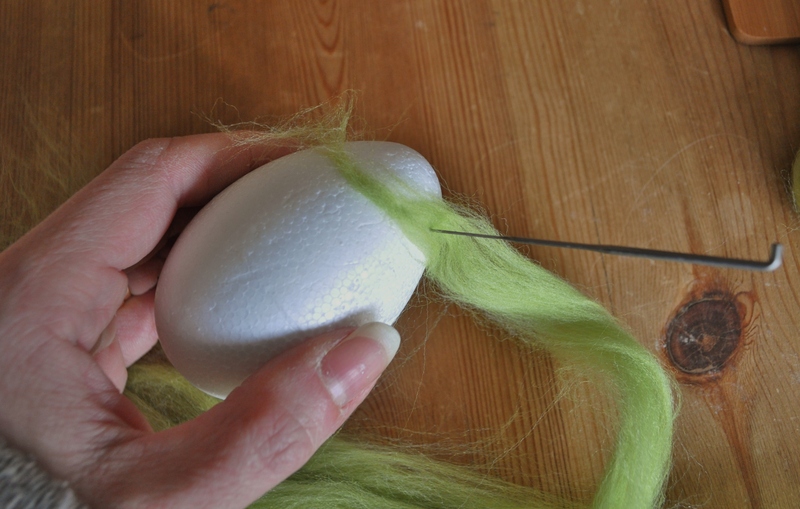 Add it to the top of the egg, take your needle and stab downwards in a straight line. This will anchor the roving in to the egg. 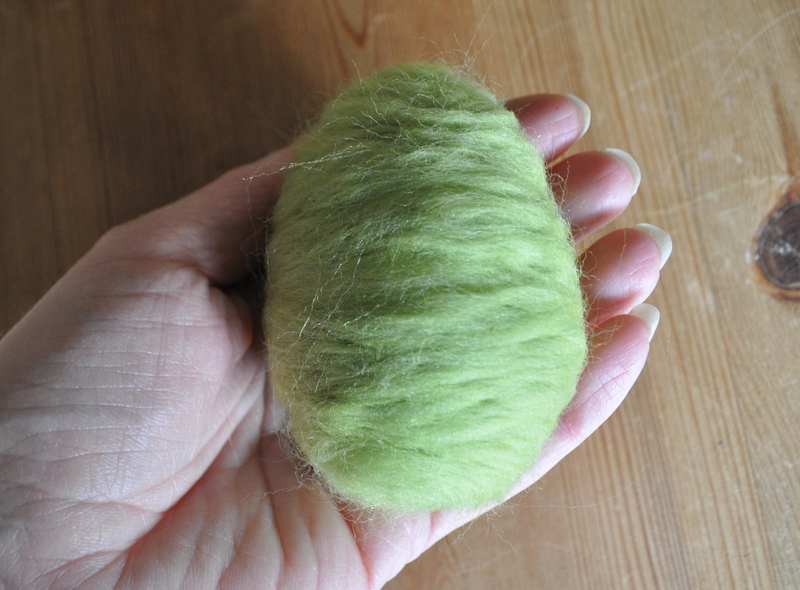 Keep stabbing the roving all over until it is stuck down. 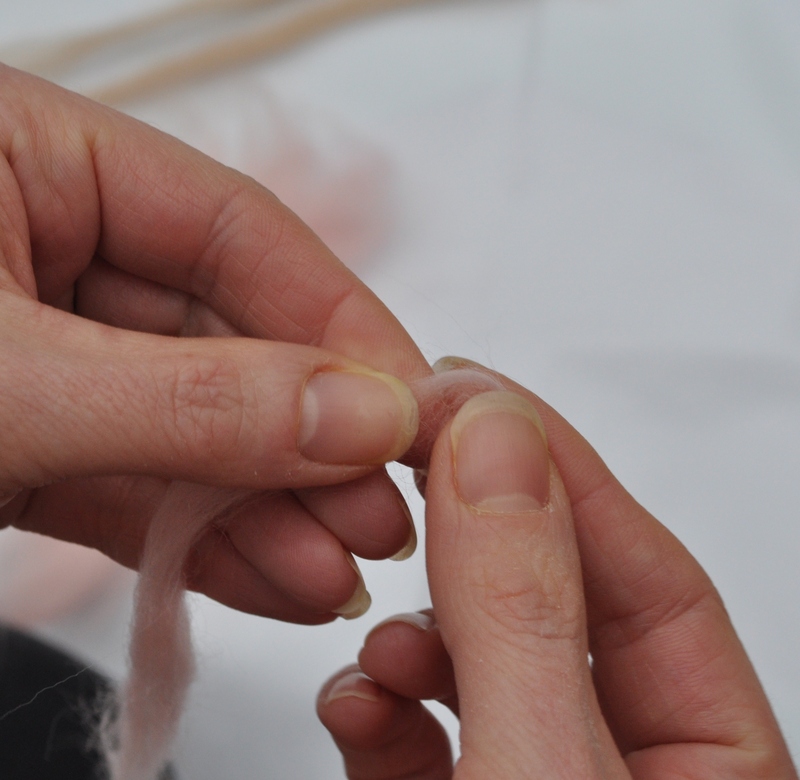 You can be quite hard and fast here but take care of your fingers and keep them out of the way of the needle. 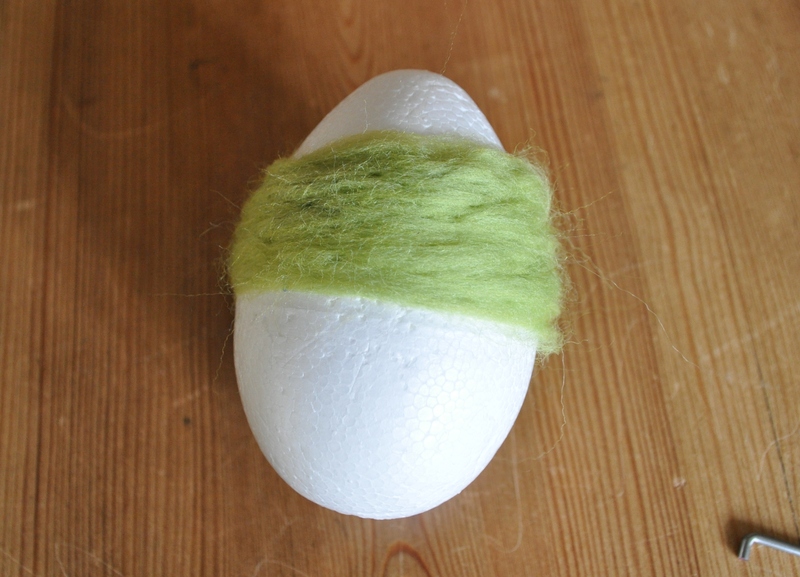 Here, I am adding stripes – take a strand of roving in the colour of your choice and lay it across the egg. Hold it fairly taut and stab in to position all the way around. The left over end bit you can either tease out (if its long) and then stab down or just stab down overlapping the ends as it should be quite thin and won’t show. 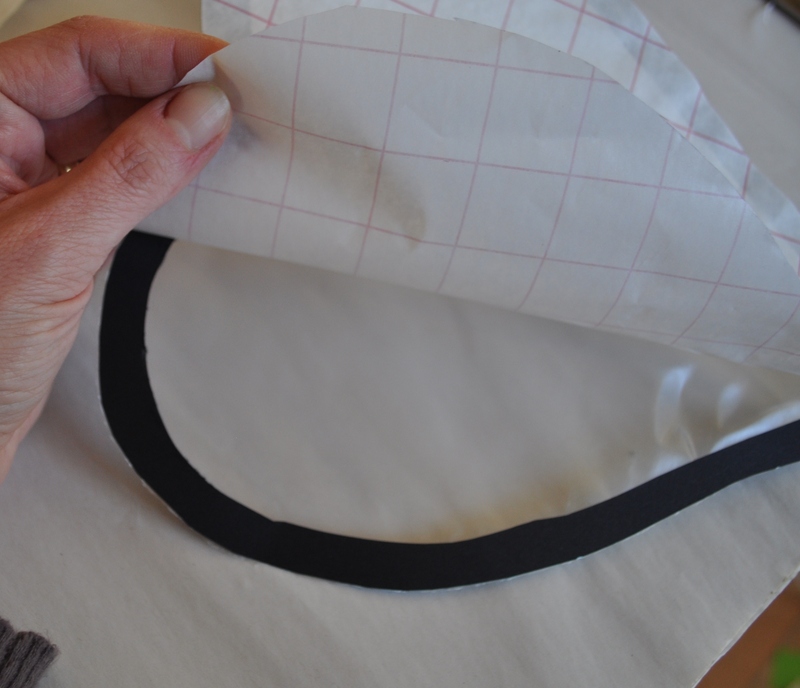 To make the lines really straight, go around the edge and gently push in any strands that are wobbly. Keep going in the colours you like, bigger stripes take less time. 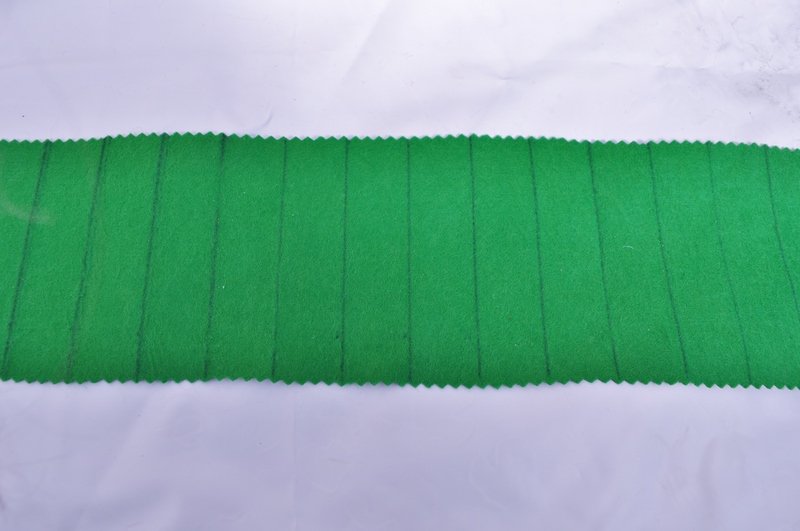 Once you get to the bottom, make another coil and felt it down in the same way. 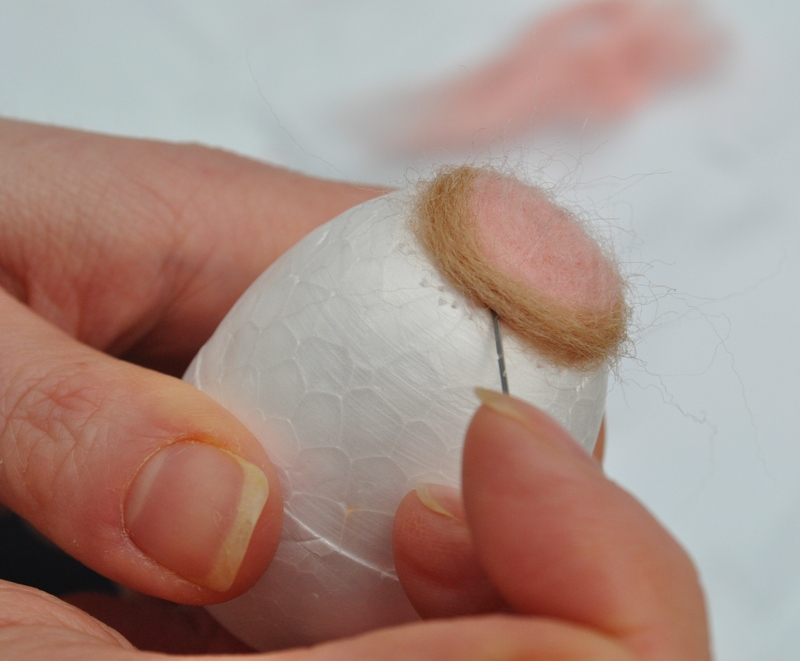 Keep going in sections like this as it gives it a neater appearance rather than wrapping the roving in one big piece around the whole egg. 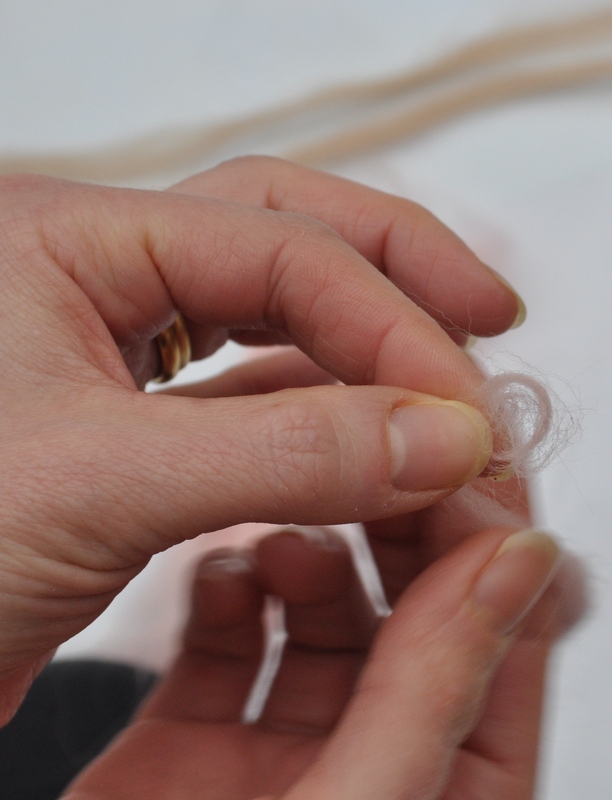 Make coils for the top and bottom as before. To add spots just make very small coils and felt them on. 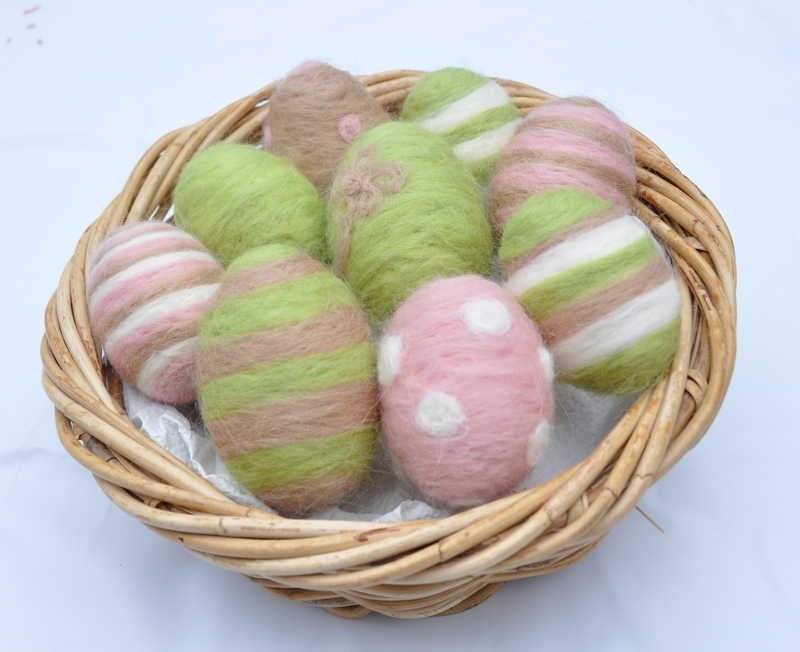 I’ve added mine to a basket but you could add a ribbon to the top and hang them. 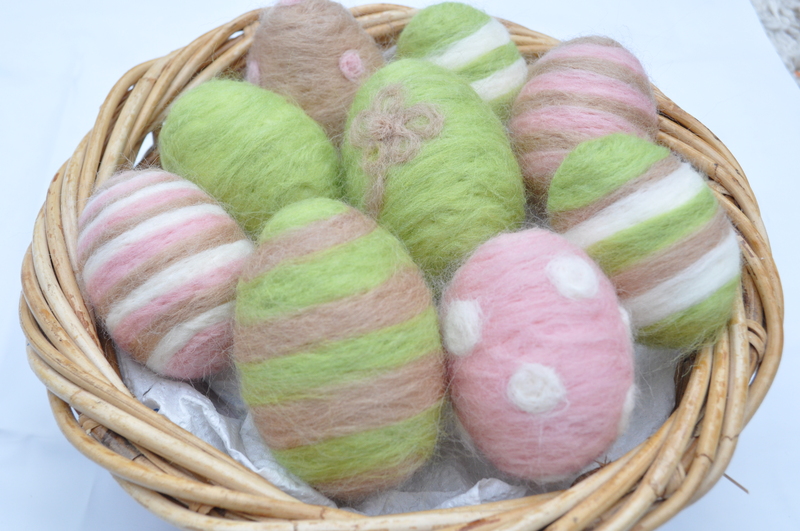 This entry was posted in Easter, Tutorials and tagged Easter crafts, easter decorations, easter eggs, Felt eggs, Felted eggs, Felted polystyrene eggs, Polystyrene eggs, Simple crafts, Styrofoam decorations, wool eggs, Wool roving eggs on March 26, 2013 by gembelina. 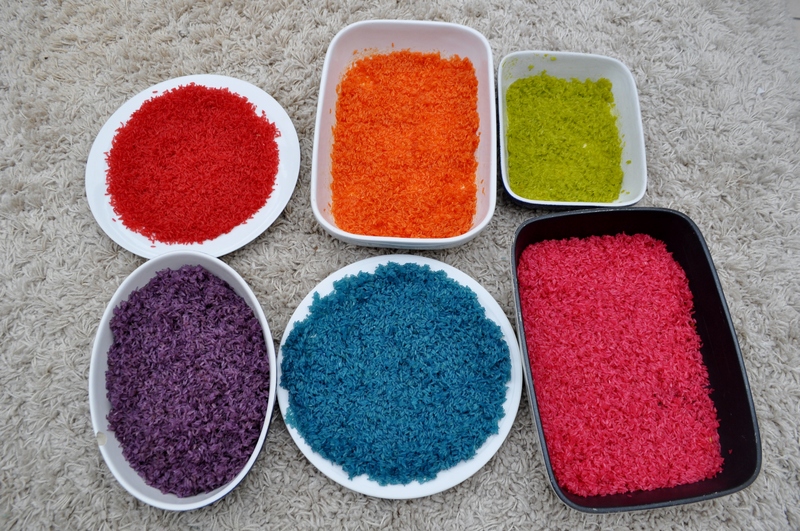 I’ve been wanting to make this coloured rice for ages, actually, since the girls have been asking for their sand pit which is currently outside, soggy, smelly and not to mention the ridiculous changeability of our weather – Its March yet its snowing outside! 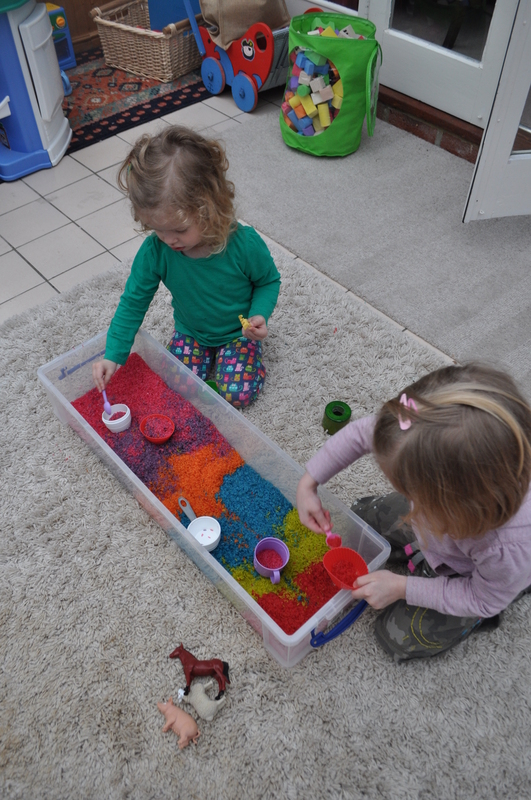 This is a great alternative that can be used indoors…if you don’t mind hoovering up a bit afterwards. I have been wanting to experiment a bit with it as I had read a recipe for adding rubbing alcohol which I really don’t like the thought of for small children to be handling or the smell! 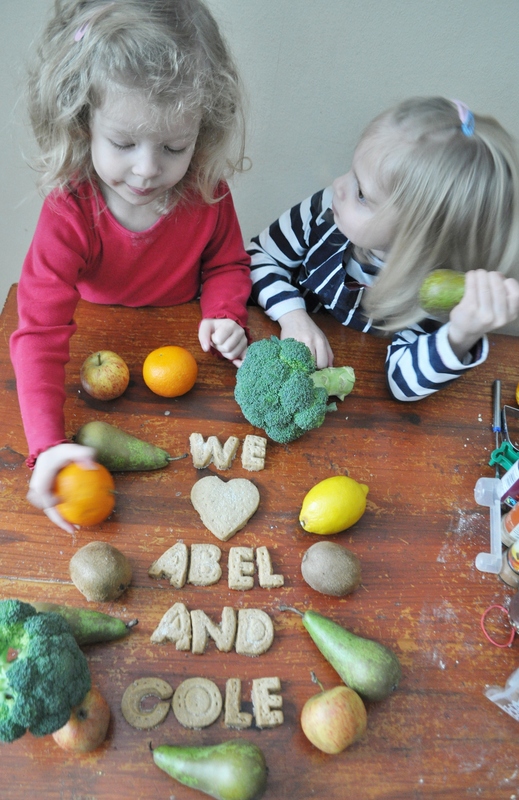 For me doing anything like this for the kids has to be simple so here’s my recipe! White Vinegar (instead of rubbing alcohol) – personally I wouldn’t bother using either. See the bottom of post for why I would choose not to use these things. Add the food colouring – don’t be shy here…. try a few blobs and add more if necessary. The more you add the more vibrant it will be. 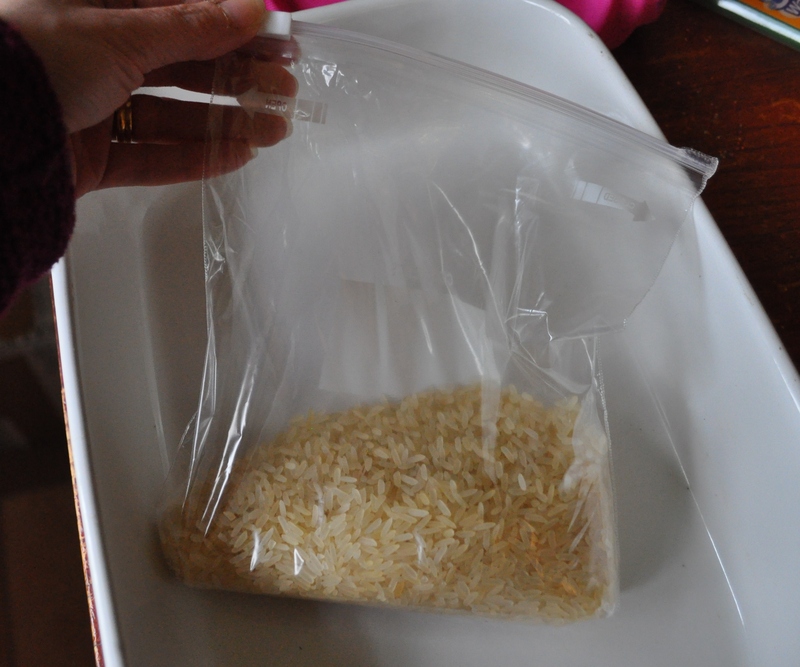 Close the bag up and massage the rice inside so its all covered. 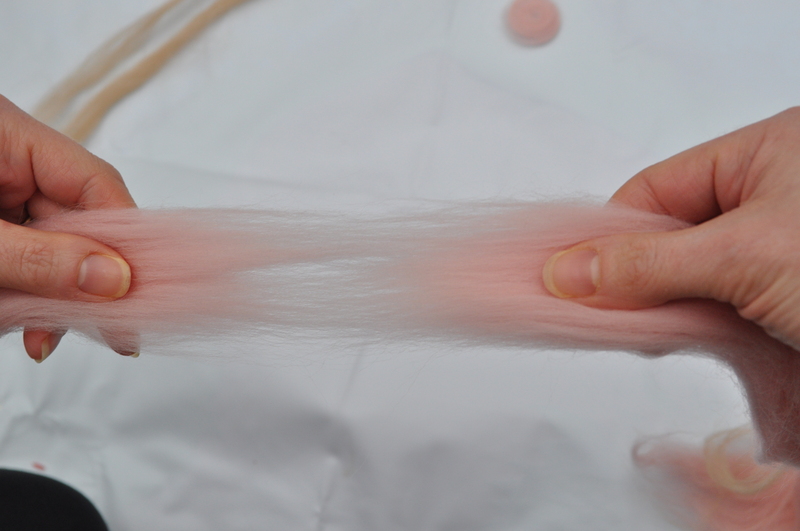 This is where the Zip Loc comes in handy as I kept adding dye until it looked really vibrant! 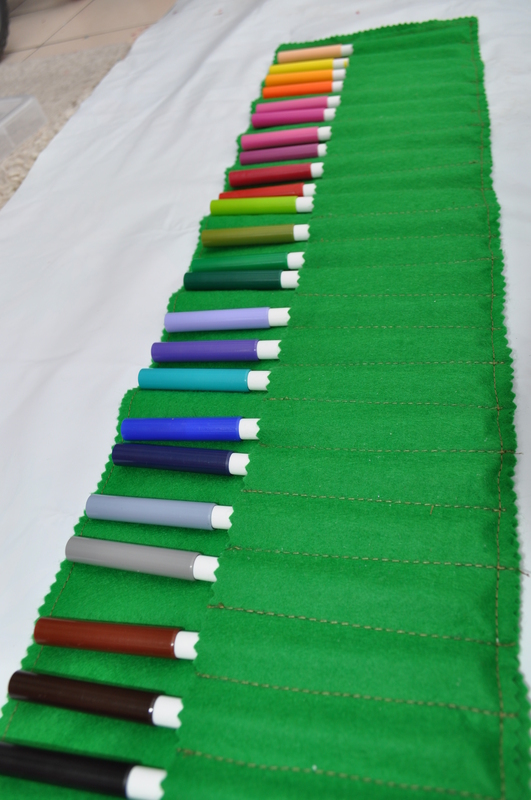 Make whatever colours float your boat, even just one colour looks good to a child. Transfer them to a dish so the rice can dry overnight (baking trays covered in foil would also be good here) I actually couldn’t wait so after a while I put them in the oven on really low for 10 mins giving it a stir half way to help it along. I still left them in their trays overnight though as the rice was hot and it was nearly bedtime anyway. 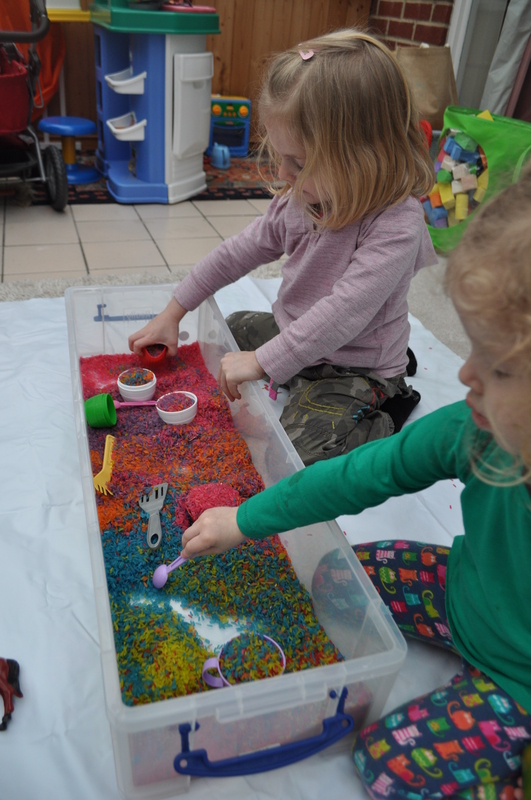 Then when its all dry put it in a container with enough room so the kids can play – I used a Really Useful Box for wrapping paper but any large plastic tub would work. How AMAZING does that look! Like so ….. because it made it so much easier to clear up! One of the games we played was hiding treasure. I found really small objects like a hair clip or a small image I had cut out of a card and hid them in the rice and they had to find them. That then gave me all sorts of ideas like hiding buttons and asking them to find the right coloured one – a bit like button bingo! 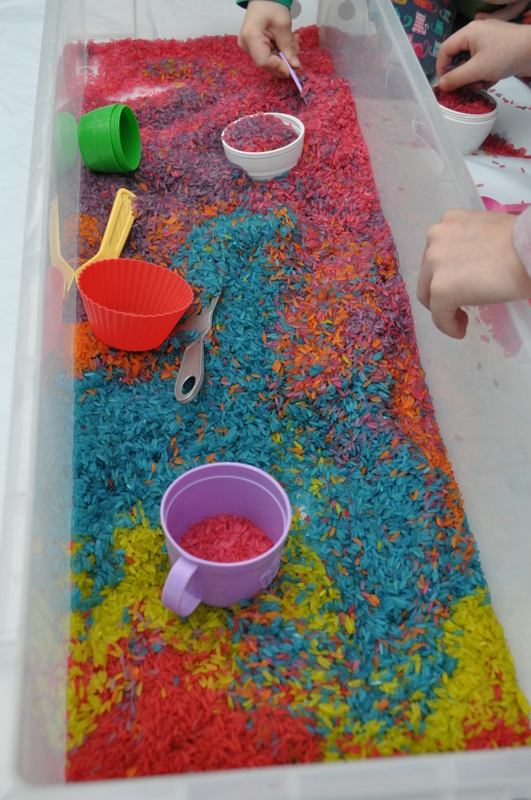 We played for ages just sprinkling it on our hands because it felt nice, a bit like sand in a way. I reckon it will last months before dirt and grime will mean I need to replace it! I have a lid for the box so that will make it easy to store away too. 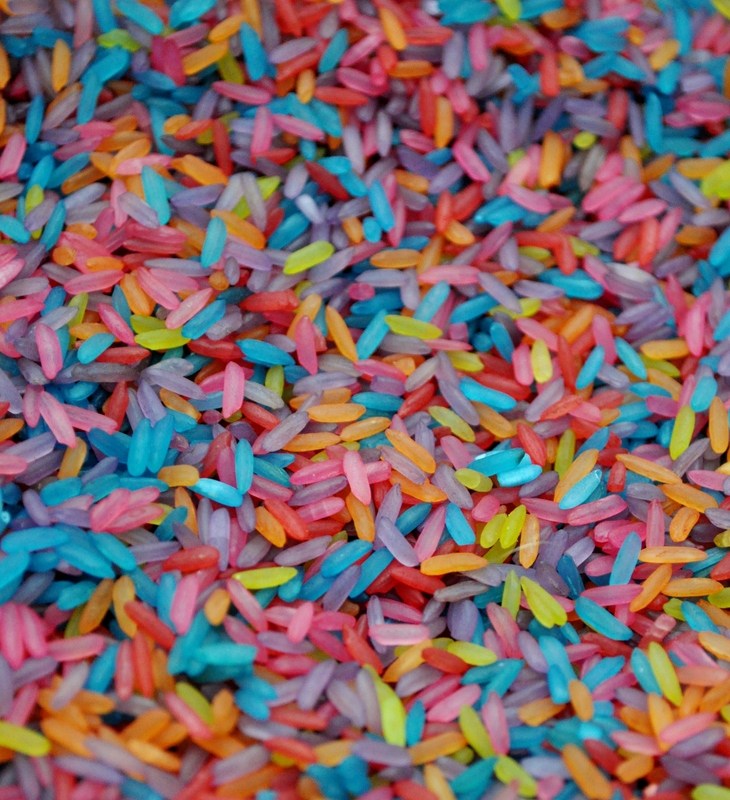 By the end it had all mixed up in to this fantastic rainbow coloured rice! Why I chose not to add anything else to the recipe! I believe using Rubbing alcohol or the safer alternative- White Vinegar makes the colour less likely to come off. 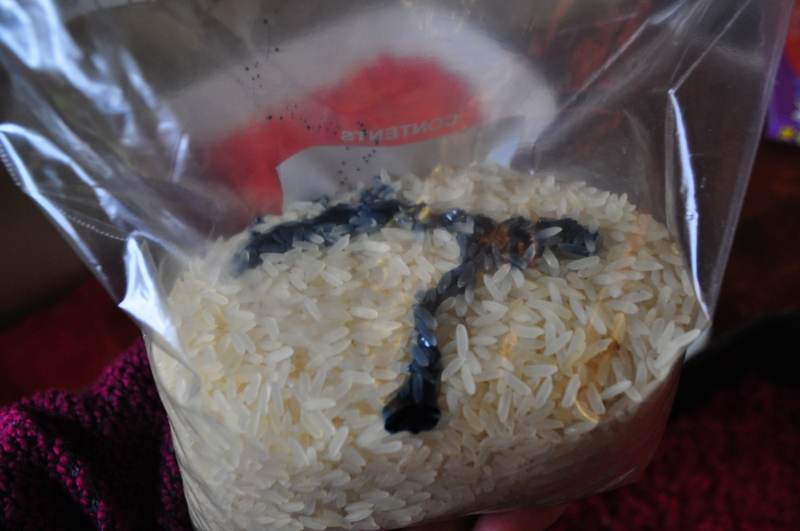 However, I found just using the food colouring, that once the rice was dry it didn’t come off anyway. 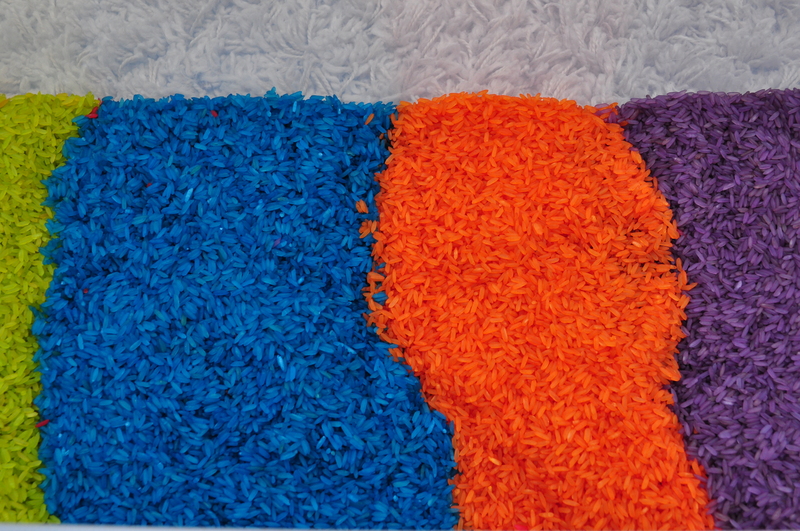 I added vinegar to the blue one to test it and to be honest it made it smell….very vinegary which wasn’t very nice! 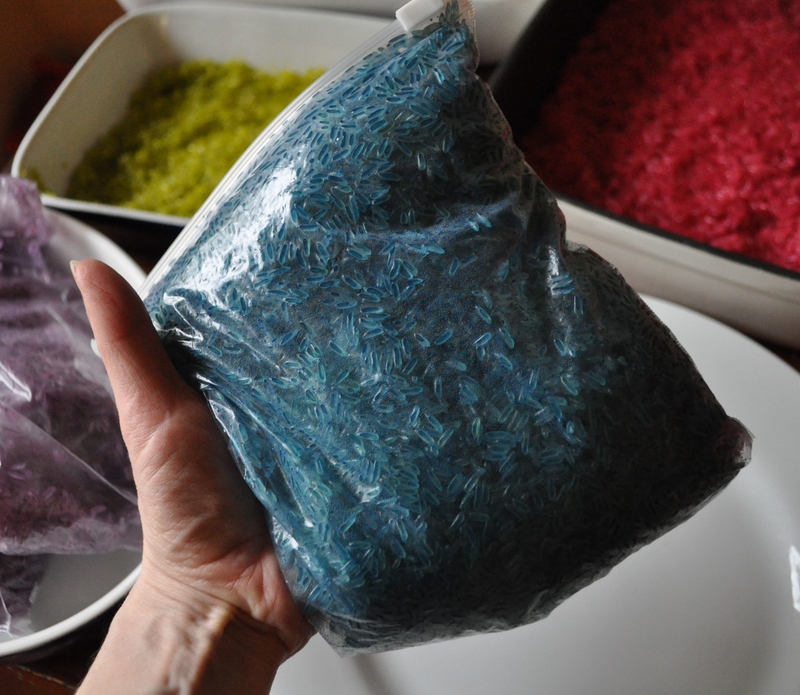 I tested it by putting some blue rice in to a bowl of water and a very faint amount of dye came off as opposed to when I put the red rice in a bowl of water more came off (not majorly but thought i’d point that out). So I would suggest if you think your little one is likely to empty their drink in it then throw the rice at the walls or maybe get really sweaty hands it may be worth using white vinegar. I’ve told my kids they mustn’t get it wet (just in case) and I will supervise them when they are playing with it anyway but it really doesn’t worry me. If you do want to use vinegar add it when you add the colouring about a tablespoon to a large cup of rice. Hope you have fun, its great fun making it as well as playing with it! 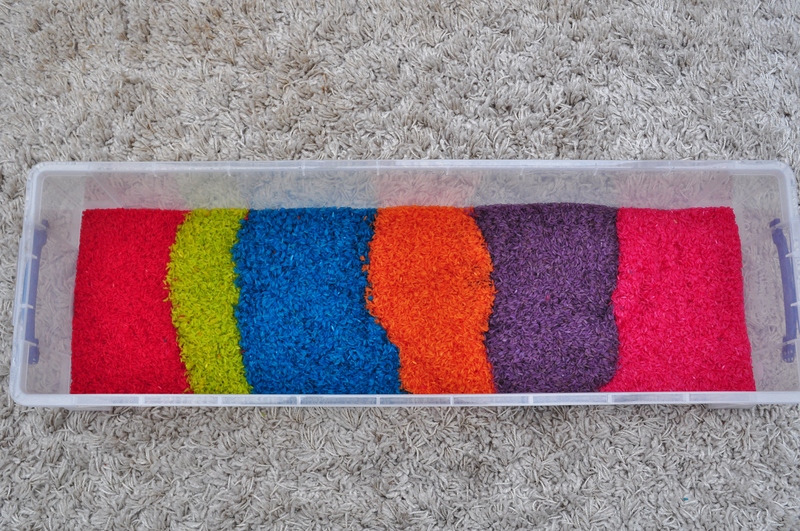 This entry was posted in Toddler crafts, Tutorials and tagged coloured rice, Food Colouring, Games for Preschoolers, games for when its cold outside, indoor fun, Pre-school, rainbow rice, sensory play, toddler play on March 12, 2013 by gembelina. 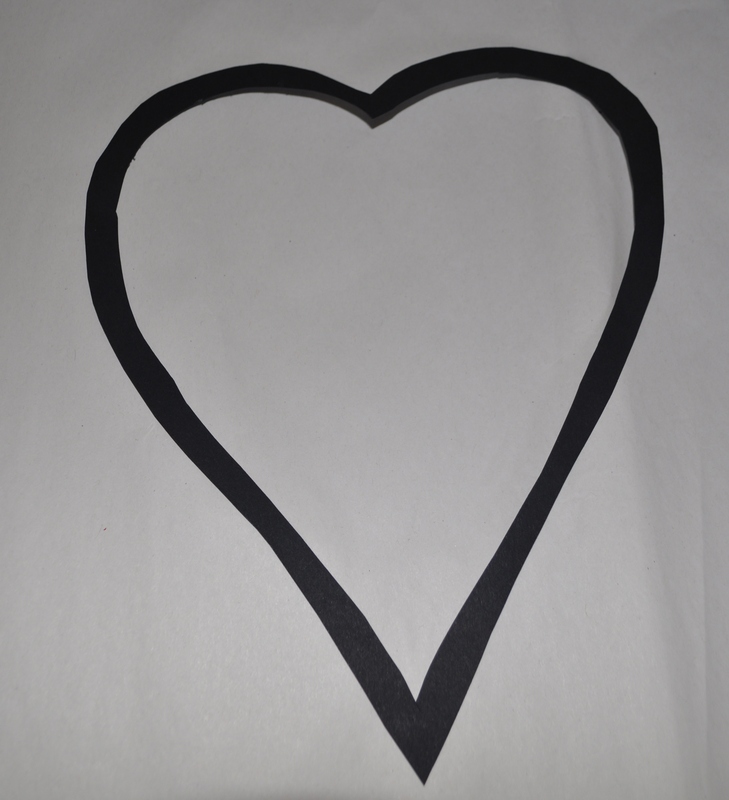 I drew a heart on some black paper and then another one about a centimetre in from the first and cut them both out to make a heart with a hole if that makes sense! 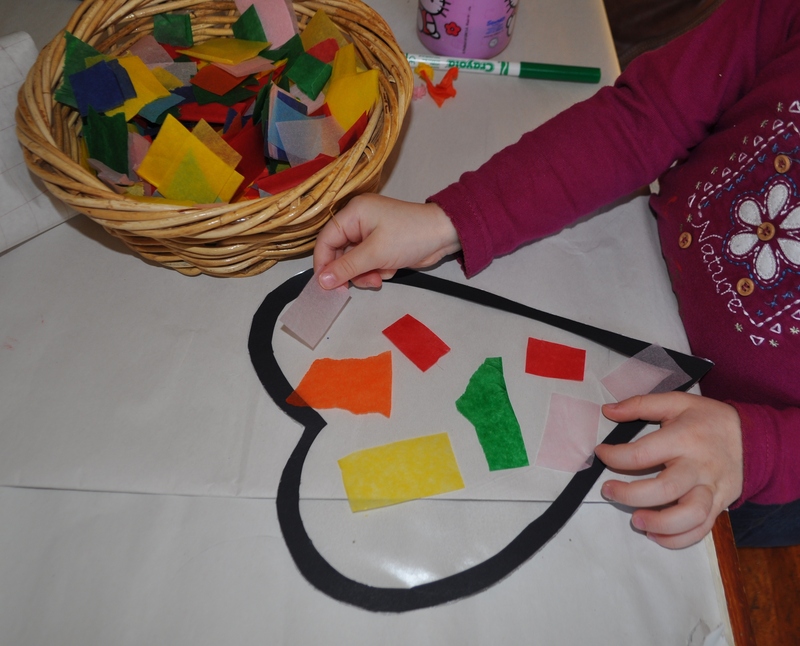 I chose a heart just because its nearly Valentine’s and I love ’em but you could do any shape you wish! Next I peeled the backing off the book covering film, stuck the heart on then put the backing back over the top so I could smooth it all out. 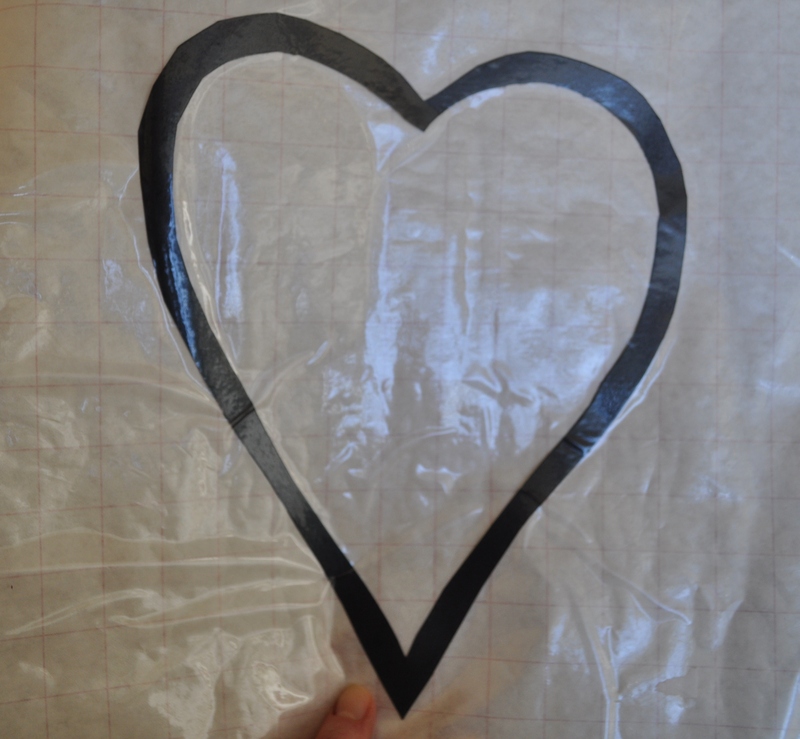 With the backing still on, I cut out the heart, then peeled it off. 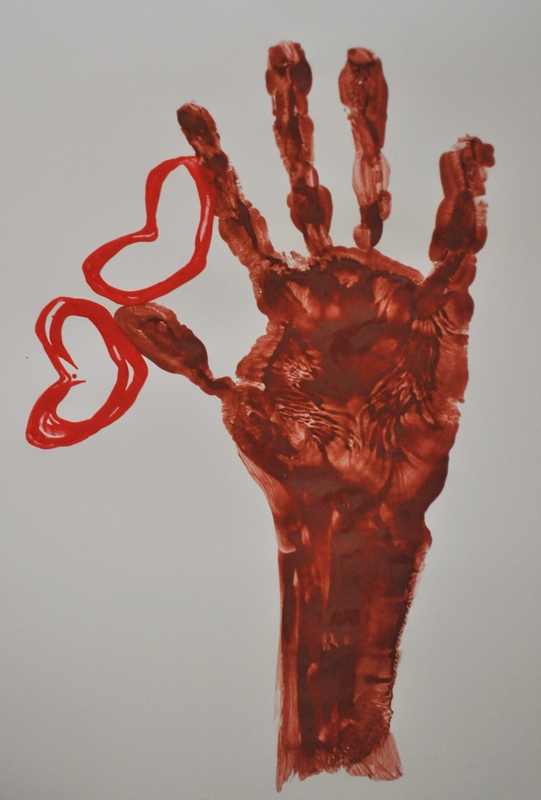 You will be left with a heart that has one sticky side. ….I really didn’t need this many photo’s to explain that I am sure…. …on to the fun bit. 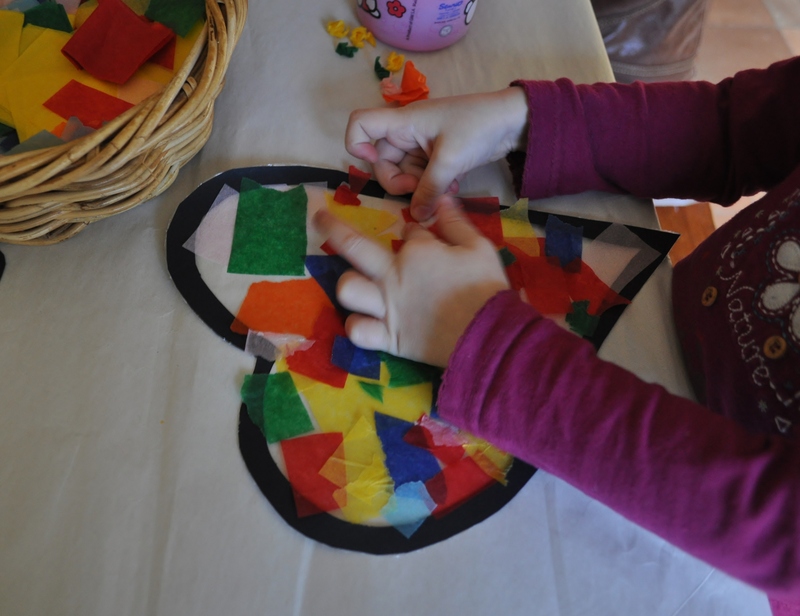 Rip up or cut shapes out of tissue paper and let your little one stick them on the shape, wherever they want, however they want, just encourage them to keep them flat as much as possible. The stickiness of the plastic just makes it so simple, in fact we used book covering film and she could re-position the tissue paper if she wanted which was great. It was old though so that may be why! Once it was all covered, she proudly stuck it on our window with a mini couple of blobs of blue tack. 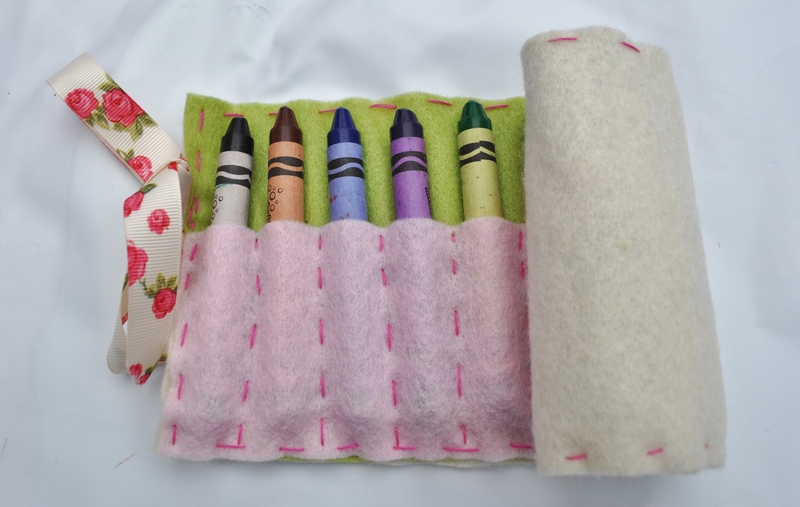 I think it would be useful to make a few shapes up but leave the backing on with some tissue paper in a sandwich bag so if you need something to keep the little one busy, you can grab one quick and off they go. 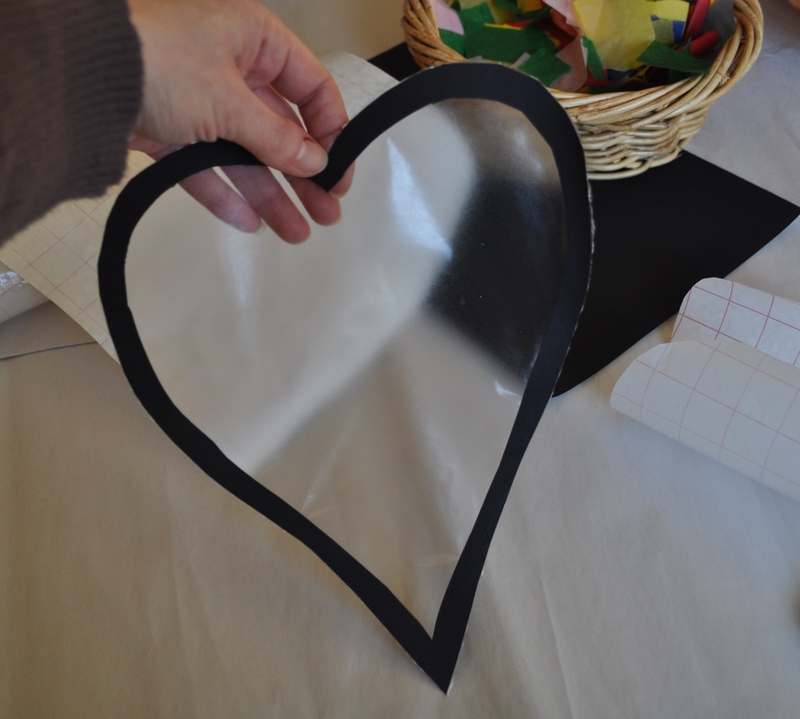 This entry was posted in Toddler crafts, Tutorials and tagged childrens crafts, childrens heart craft, childrens valentines craft, hearts, sticky back plastic, Tissue paper, tissue paper heart, Toddler crafts, Valentine craft on February 8, 2013 by gembelina. We thought we would make my dad a picture who is in hospital at the moment. 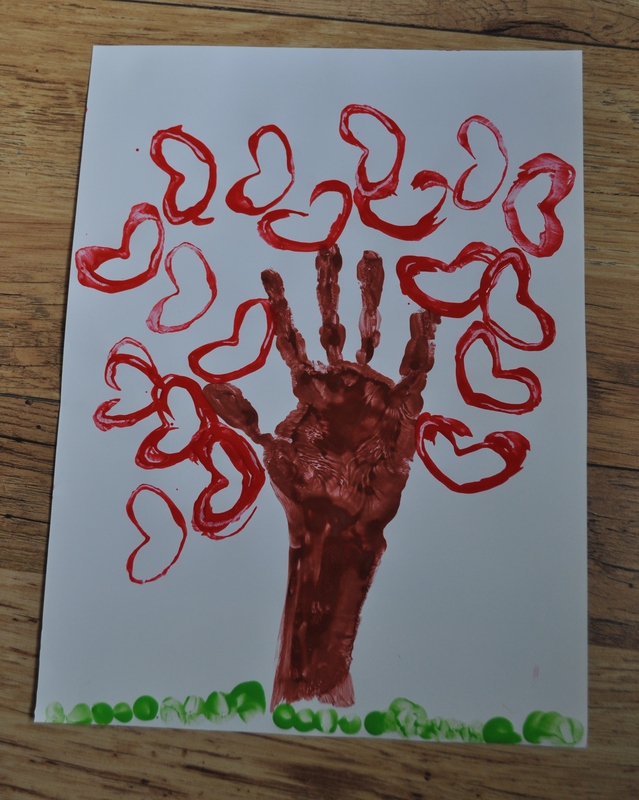 This handprint heart tree is really simple and quick and would be great for any occassion where toddler input is needed, like Mothers Day, Fathers Day or Valentines Day! All you need is a toilet roll and some paint. 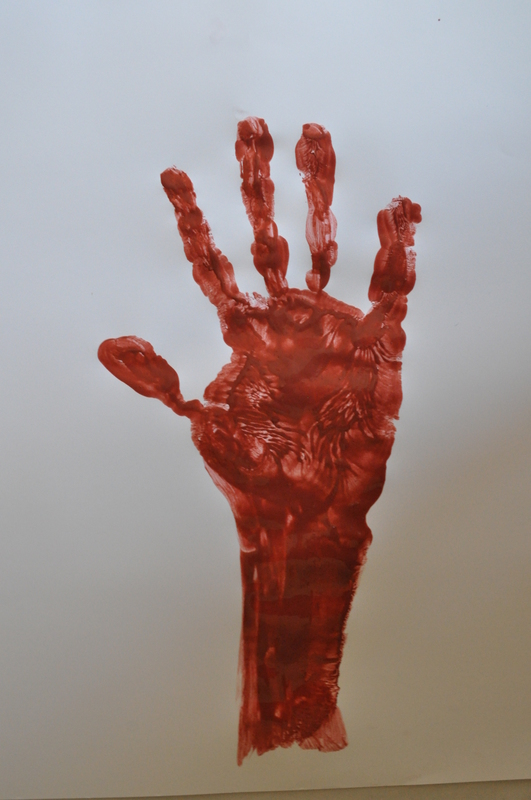 First I painted my littles ones hand and arm and pressed it on to the paper. I filled in any spaces that didn’t take with the paint to make it look like a tree trunk and branches. 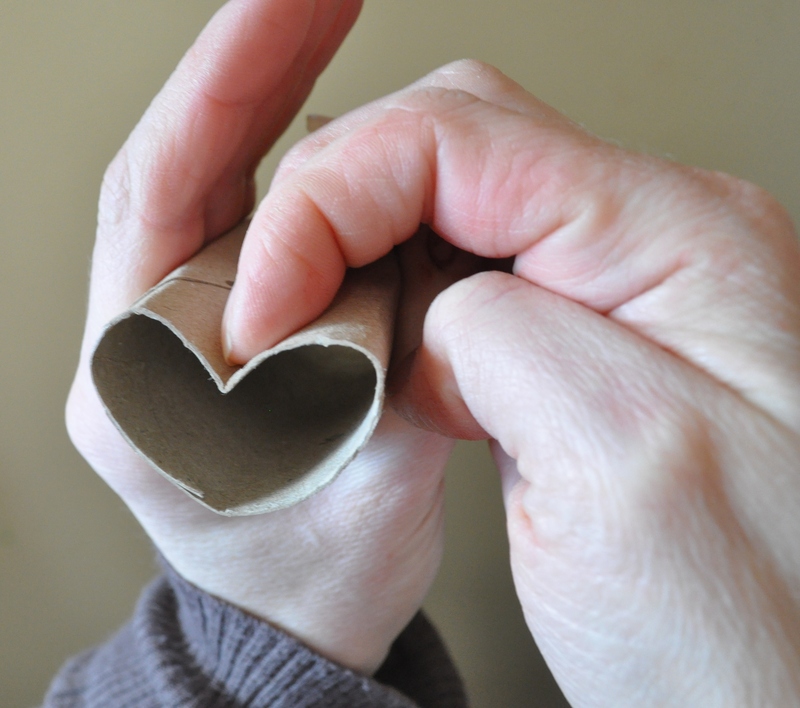 Then I pressed the toilet roll in to a heart shape. This will be the stamp to make heart shaped leaves. 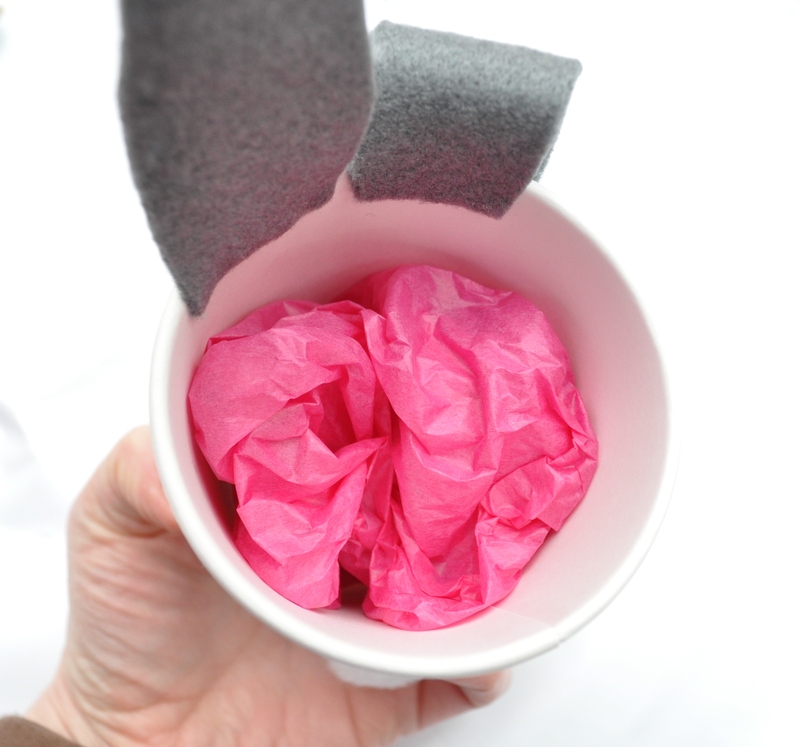 Press the end of the toilet roll in to red or pink paint and print all over the tree to create the leaves. I put the paint on a plate to make this easier for the girls to do. A few green fingerprints later for grass and Grandads picture is done! 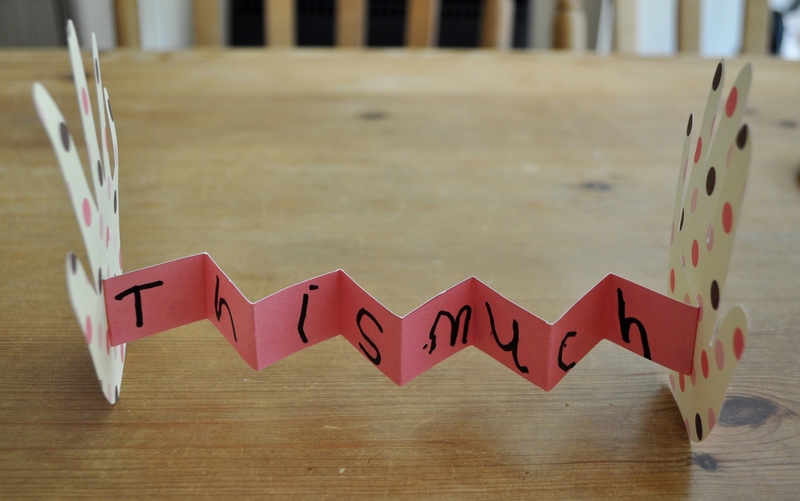 I think this would look good with hearts cut out of pink, red or even green paper, then the child can just stick them on instead of using the toilet roll. 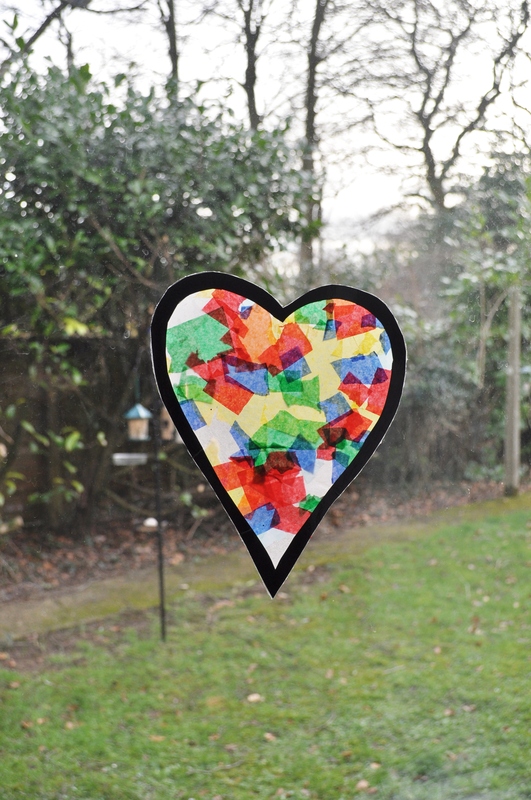 This entry was posted in Toddler crafts, Tutorials and tagged fathers day craft, get well soon, handprint, hearts, mothers day craft, Toddler crafts, toilet roll craft, toilet roll heart, Tree, valentines on February 6, 2013 by gembelina. 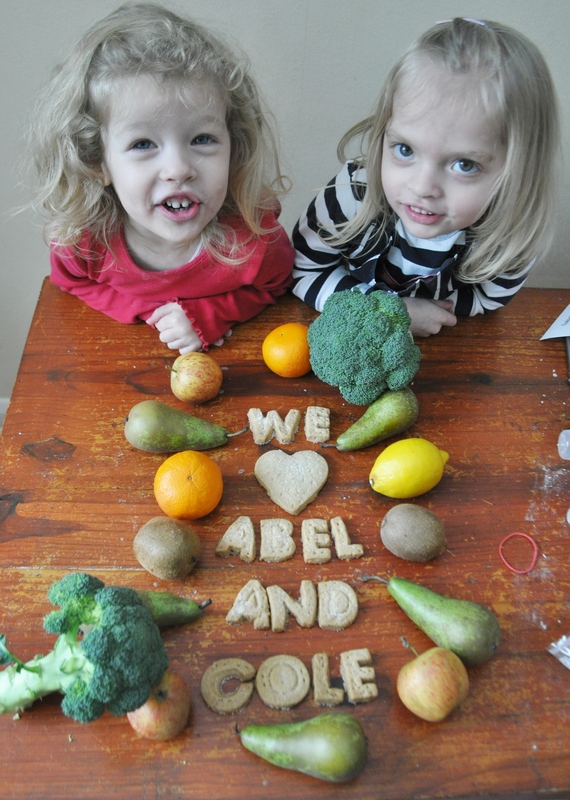 Woohoo we won the Abel & Cole photo competition!! 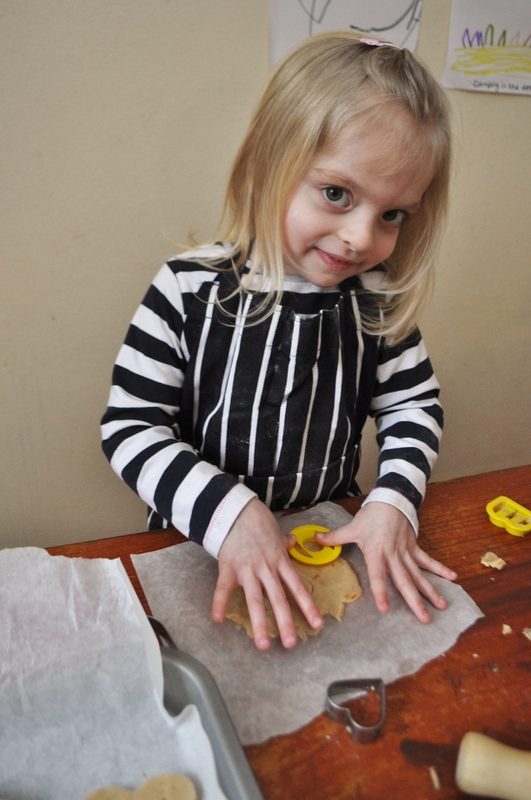 You can read about the fun we had making the shortbread here. 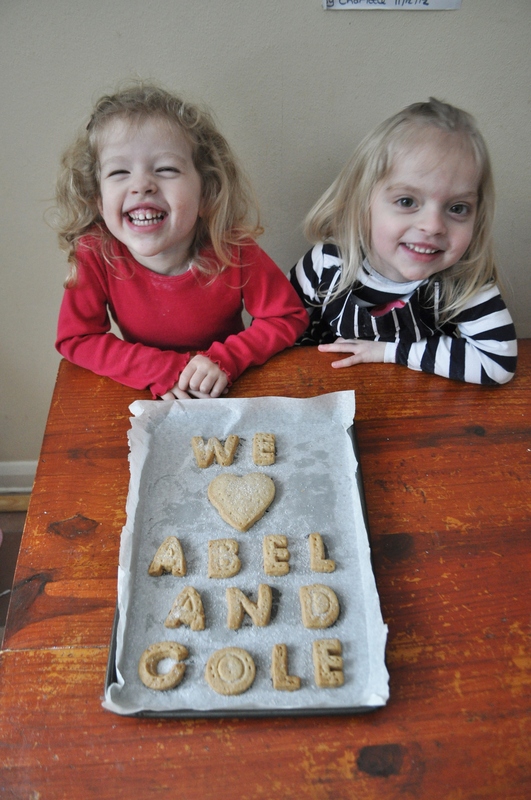 Here is the photo that we submitted…. 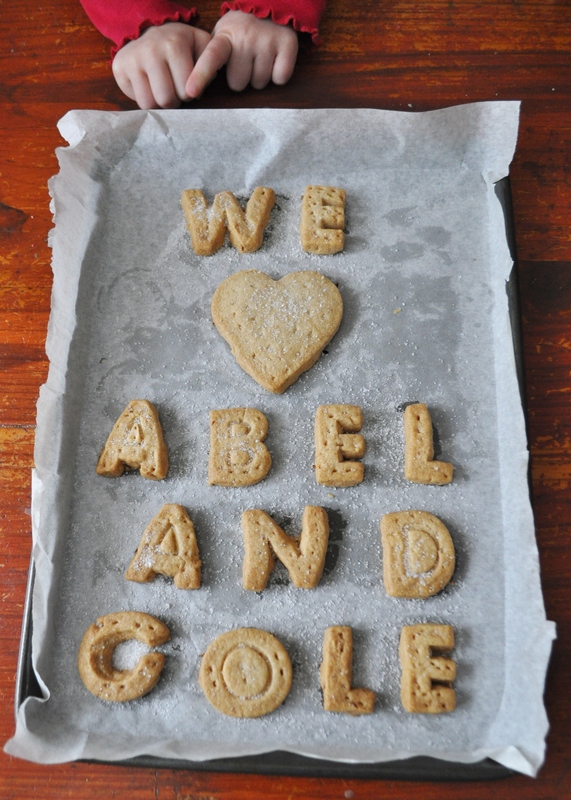 This entry was posted in Baking and tagged Abel & Cole, Baking, competition, photo, Winners on January 30, 2013 by gembelina. We had a go at baking for a change! 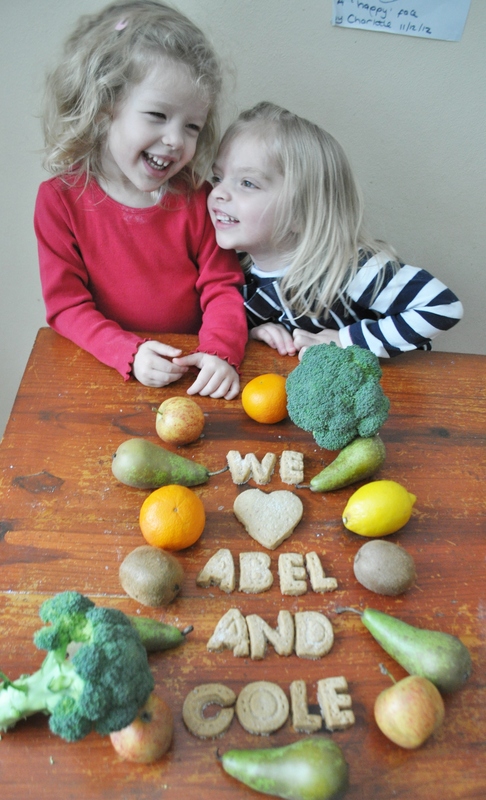 We started an Abel & Cole veg box scheme a couple of weeks ago and it is great! I love that the veg is organic, I’ve tried and liked veg I wouldn’t have bought before and all the packaging is recyclable plus the company is fun and quirky which leads me to the reason for this post. 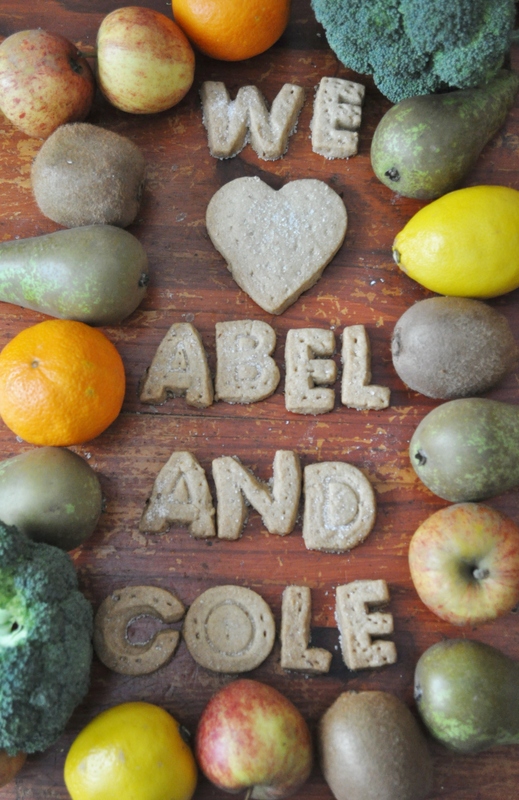 Abel & Cole do fun competitions that I came across when I read their blog and this months was a Photo baking competition. All you have to do is bake some Citrus & Spice Shortbread, the recipe is located on their blog which you can find here and send in a photo and you can win the key ingredients to the next months recipe. Now, I don’t bake but when I read that they like a bit of quirkiness in the photo’s it appealed to my creative side and I knew the girls would love to do some baking so we had a go! 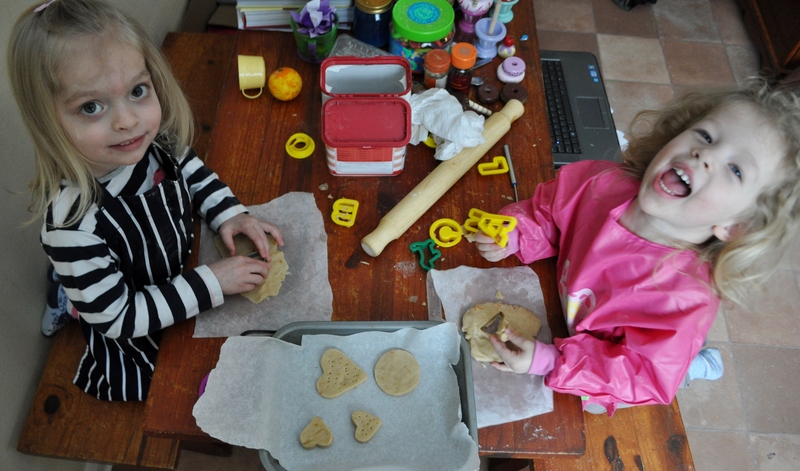 The recipe was really easy and great for the kids to get stuck in, we soon made the dough and the girls used alphabet and shape cutters which they loved! Here they are being cheeky monkeys. The girls had great fun especially as they were making up new vegetable names whilst they were doing it like broccopear and carroty apples, which they thought was hilarious! 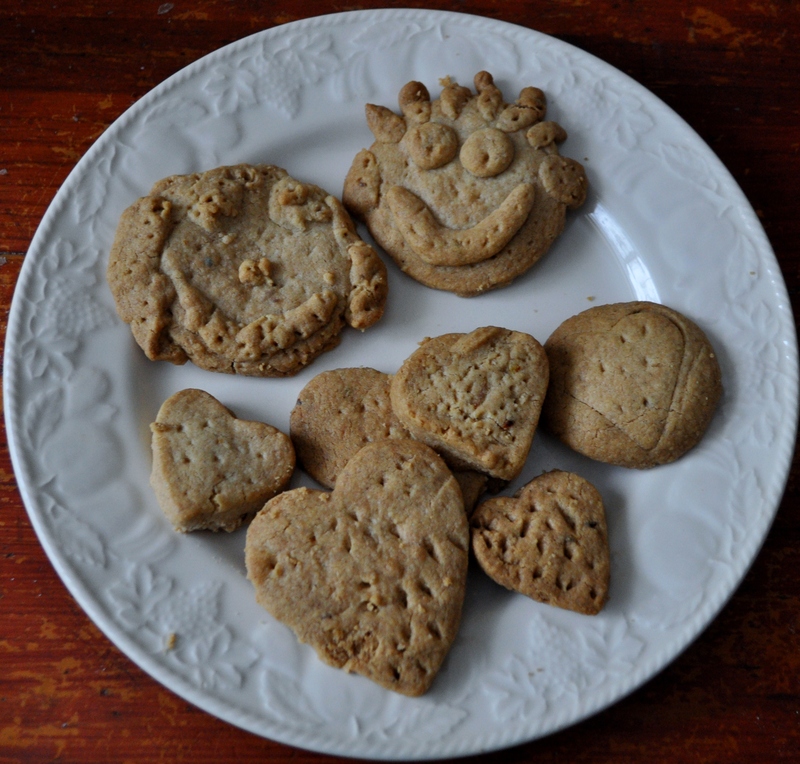 We finally got our photo which is this one…..
We also made these with the leftover dough ….apparently the top left is me and the top right is Daddy We really enjoyed baking and actually I CAN do it! The shortbread was really yummy, I recommend it! We had nearly polished off the lot by the end of the day…….diet starts Monday right?! 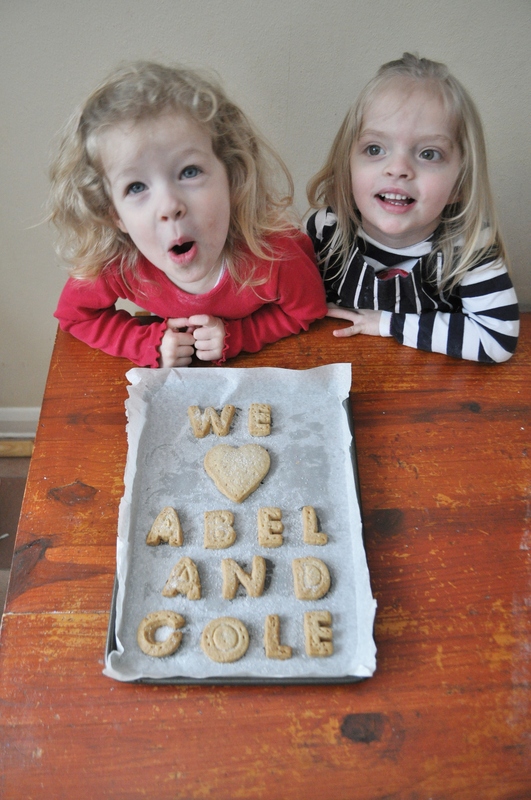 This entry was posted in Baking, Toddler crafts and tagged Abel & Cole, Abel & Cole competition, Abel and Cole, Baking, baking with children, Shortbread on January 23, 2013 by gembelina.